Thermostable viral polymerases exhibiting a combination of activities selected from, proofreading (3'-5') exonuclease activity, nick translating (5'-3') nuclease activity, synthetic primer-initiated polymerase activity, nick- initiated polymerase activity, reverse transcriptase activity, strand displacement activity, and/or decreased discrimination against incorporation of nucleotide analogs. Also provided are compositions including the polymerases, polynucleotides encoding the polymerases and methods of using the polymerases. There are seven known families of DNA polymerases, including A, B, C, D, X, Y and RT. The most widely used DNA polymerases are family A and B polymerases, especially those that are stable to greater than 90°C and are active at temperatures of a least 70°C, conditions commonly used in DNA detection and analysis methods, e.g., polymerase chain reaction or thermocycled DNA sequencing. These DNA polymerases are referred to as "thermostable" DNA polymerases. Thermostable DNA polymerases are commonly used in recombinant DNA technology to generate polynucleotide sequences from both known and unknown target sequences. It is appreciated that the biochemical attributes of a given enzyme may either enhance or limit its usefulness, depending upon the particular reaction conditions and desired functions. Characteristics that are generally considered to affect the utility of thermostable polymerases include strand displacement activity, processivity, both 3'-5' and 5'-3' exonuclease activity, affinity for template DNA and for nucleotides (both canonical and modified), error rate and degree of thermostability. Despite extensive investigation to discover new polymerases and attempts to manipulate buffer formulations to optimize polymerase activity, there remains a need for thermostable DNA polymerases having an appropriate combination of the above attributes for particular applications. Many bacterial and archaeal thermostable DNA polymerases are known and used, including Taq, VENTR and Bst. Each of these enzymes, while effective for use in particular applications, has limitations. For example, both Bst and Taq lack proofreading activity and, therefore, have a relatively high error rate. Extensive efforts to isolate new thermostable DNA polymerases have provided dozens of alternative enzymes, but only modest improvements in biochemical properties have resulted. Viral DNA polymerases (including phage polymerase), like their bacterial counterparts, catalyze template-dependent synthesis of DNA. However, viral polymerases differ significantly in their biochemical characteristics from the bacterial polymerases currently used for most DNA and RNA analysis. For example, T5, T7 and phi29 DNA polymerases are among the most processive enzymes known. RB49 DNA polymerase, in addition to a highly active proofreading function, has the highest known fidelity of initial incorporation. T7 and phi29 DNA polymerases have the lowest measured replication slippage due to high processivity. T7 DNA polymerase can efficiently incorporate dideoxynucleotides, thereby enabling facile chain terminating DNA sequence analysis. 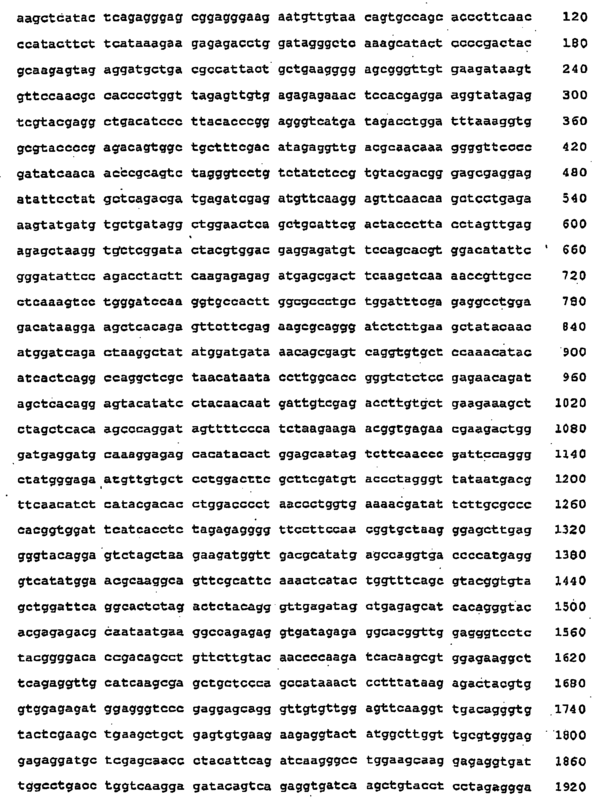 The viral reverse transcriptases are unique among reagents in their efficiency in synthesizing a DNA product using an RNA template. Despite their advantages, deficiencies among the available viral enzymes are apparent. Notably, there is no thermostable viral polymerase widely available. U.S. Patent Publication US 2003/0087392 describes a moderately thermostable polymerase isolated from bacteriophage RM378. 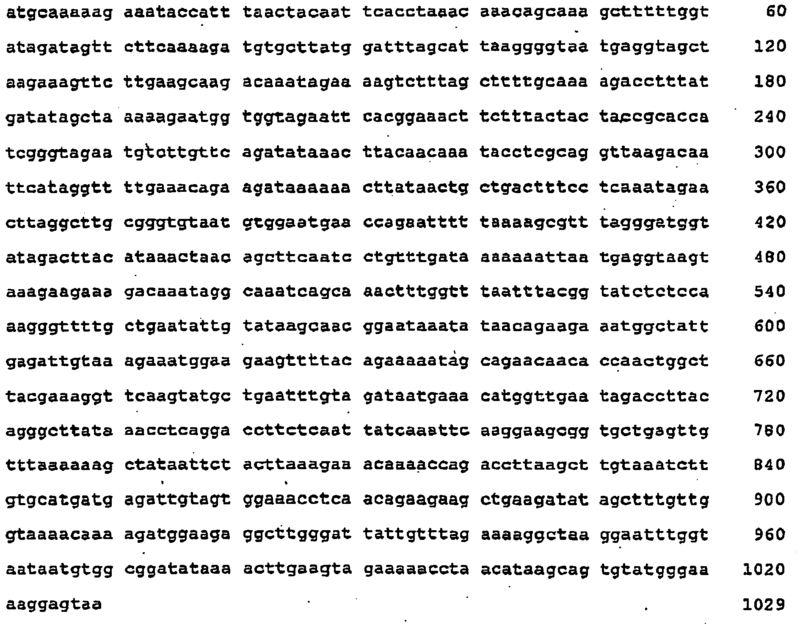 Although this polymerase is described as "expected to be much more thermostable than [that] of bacteriophage T4," and is said to lack both 3'-5' and 5'-3' exonuclease activities, RM378 polymerase is not thermostable enough for thermocycled amplification or sequencing. A larger pool of potential viral reagent DNA polymerases is needed for use in DNA detection and analysis methods. The invention pertains generally to polymerases suitable for use as reagent enzymes. Because the polymerases described herein were isolated from thermophilic viruses, they are significantly more thermostable than those of other (e.g. mesophilic) viruses, such as the T4 bacteriophage of Escherichia coli. The enhanced stability of the polymerases described herein permits their use under temperature conditions which would be prohibitive for other enzymes and increasing the range of conditions which can be employed, thereby improving amplification specificity and providing a thermostable viral enzyme that can be used in thermocycling. Accordingly, one aspect of the invention provides a substantially purified polymerase having an amino acid sequence comprising SEQ ID NO:2, SEQ ID NO:4, SEQ ID NO:6, SEQ ID NO:8, SEQ ID NO:10, SEQ ID NO:12, SEQ ID NO:14, SEQ ID NO:16, SEQ ID NO:18, SEQ ID NO:20 or sequence variants thereof. One aspect also provides a substantially purified polymerase that demonstrates nick-initiated polymerase activity, primer-initiated polymerase activity, 3'-5' exonuclease (proofreading) activity, reverse transcriptase activity and/or strand displacement activity. In some embodiments the purified polymerases lack 3'-5' exonuclease activity. Other polymerases do not discriminate against nucleotide analog incorporation. Other aspects provide isolated polynucleotide encoding the polymerases, polynucleotide constructs comprising the polynucleotides, recombinant host cells comprising the polynucleotide constructs and methods of producing thermostable polymerases. In another aspect, the invention provides a method of synthesizing a DNA copy or complement of a polynucleotide template. The method includes contacting the template with a polypeptide of the invention under conditions sufficient to promote synthesis of the copy or complement. In some embodiments, the template is RNA, and in other embodiments, the template is DNA. Other aspects of the invention will become apparent by consideration of the detailed description of several embodiments and from the claims. FIG. 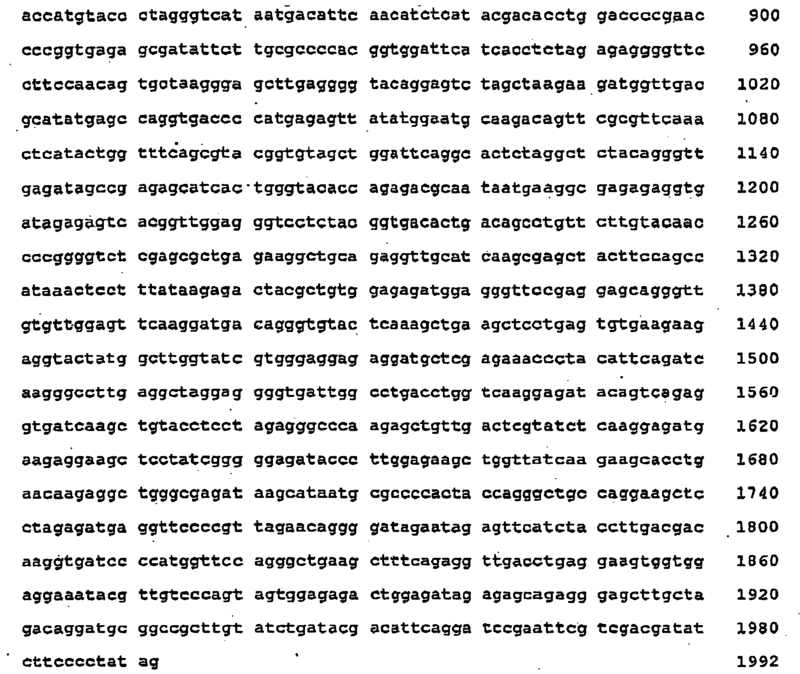 1 is a photographic image of an electrophoretic gel showing results of polymerase chain reaction (PCR) amplification of a 1 kb pUC19 sequence using a polymerase of the invention and two commercially available polymerases. FIG. 2 is a photographic image of an electrophoretic gel showing the results of PCR amplification using a polymerase of the invention. FIG. 3 is a photographic image of an electrophoretic gel showing results of PCR amplification of a 1 kb Bacillus cyc gene sequence (a guanidine/cytosine-rich template) using a polymerase of the invention and five commercially available polymerases. FIG. 4 is a photographic image of an electrophoretic gel used to resolve the the product of an RT-PCR reaction in which a 294 bp cDNA was reverse-trasncribed and amplified from total mouse RNA using specific primers and a polymerase of the invention. FIG. 5 shows photographic images of two electrophoretic gels, one used to resolve an isothermal amplification reaction (panel A) in which single-stranded and double-stranded templates were amplified using a polymerase of the invention and a PCR amplification reaction (panel B) used to verify the identity of the isothermal amplification product. FIG. 6 is a photographic image of an electrophoretic gel used to resolve amplification reactions carried out without added primers using two polymerases of the invention in the presence or absence of a commercially available nicking enzyme. Before any embodiments of the invention are explained in detail, it is to be understood that the invention is not limited in its application to the details of construction and the arrangement of components set forth in the following description or illustrated in the following figures and examples. The invention is capable of other embodiments and of being practiced or of being carried out in various ways. Also, it is to be understood that the phraseology and terminology used herein is for the purpose of description and should not be regarded as limiting. The terms "including," "comprising," or "having" and variations thereof are meant to encompass the items listed thereafter and equivalents thereof as well as additional items. As used in this specification and the appended claims, the singular forms "a," "an," and "the" include plural referents unless the content clearly dictates otherwise. Thus, for example, reference to a composition containing "a polynucleotide" includes a mixture of two or more polynucleotides. It should also be noted that the term "or" is generally employed in its sense including "and/or" unless the content clearly dictates otherwise. All publications, patents and patent applications referenced in this specification are indicative of the level of ordinary skill in the art to which this invention pertains. All publications, patents and patent applications are herein expressly incorporated by reference to the same extent as if each individual publication or patent application was specifically and individually indicated by reference. In case of conflict between the present disclosure and the incorporated patents, publications and references, the present disclosure should control. 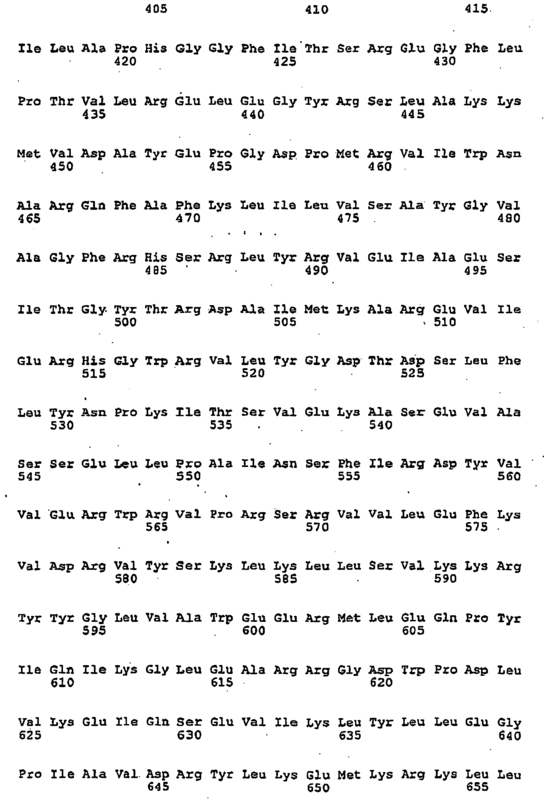 It also is specifically understood that any numerical value recited herein includes all values from the lower value to the upper value, i.e., all possible combinations of numerical values between the lowest value and the highest value enumerated are to be considered to be expressly stated in this application. For example, if a concentration range is stated as 1% to 50%, it is intended that values such as 2% to 40%, 10% to 30%, or 1% to 3%, etc., are expressly enumerated in this specification. These are only examples of what is specifically intended. The invention relates to polymerases, polynucleotides and constructs encoding the polymerases, and methods for using the polymerases. The polymerases of the invention are suitable for sequence-specific methods including PCR, as well as whole genome nucleic acid amplification. As will be appreciated, the polymerases described herein are useful in any research or commercial context wherein polymerases typically are used for DNA analysis, detection, or amplification. As used herein, "polymerase" refers to an enzyme with polymerase activity that may or may not demonstrate further activities, including, but not limited to, nick-initiated polymerase activity, primer-initiated polymerase activity, 3'-5' exonuclease (proofreading) activity, reverse transcriptase activity and/or strand displacement activity. Polymerases of the invention suitably exhibit one or more activities selected from polymerase activity, proofreading (3'-5') exonuclease activity, nick translating (5'-3') nuclease activity, primer-initiated polymerase activity, reverse transcriptase activity, strand displacement activity, and/or increased propensity to incorporate chain terminating analogs. As will be appreciated by the skilled artisan, an appropriate polymerase may be selected from those described herein based on any of these and other activities or combinations thereof, depending on the application of interest. The polymerases described herein are of viral origin. For purposes of this description, a "virus" is a nucleoprotein entity which depends on host cells for the production of progeny. The term encompasses viruses that infect eukaryotic, bacterial or archaeal hosts, and may be used interchangeably with "bacteriophage," "archaeaphage" or "phage," depending on the host. The purified polymerases of the invention were compared to known polymerases and found to have one or more enzymatic domains conserved. The enzymatic domains and other domains (e.g., signal peptide, linker domains, etc.) can be readily identified by analysis and comparison of the sequence of the viral polymerases with sequences of other polymerases using publicly available comparison programs, such as ClustalW (European Bioinformatics Institute). The polymerases of the invention are substantially purified polypeptides. As used herein, the term "purified" refers to material that is at least partially separated from components which normally accompany it in its native state. Purity of polypeptides is typically determined using analytical techniques such as polyacrylamide gel electrophoresis or high performance liquid chromatography. A polypeptide that is the predominant species present in a preparation is "substantially purified." The term "purified" denotes that a preparation containing the polypeptide may give rise to essentially one band in an electrophoretic gel. Suitably, polymerases of the invention are at least about 85% pure, more suitably at least about 95% pure, and most suitably at least about 99% pure. The polymerases of the invention are thermostable. The term "thermostable" is used herein to refer to a polymerase that retains at least a portion of one activity after incubation at relatively high temperatures, i.e., 50-100° C. In some cases, thermostable enzymes exhibit optimal activity at relatively high temperatures, i.e., about 50-100° C. In some embodiments, the thermostable polymerases exhibit optimal activity from about 60°C to 70°C. Most suitably, thermostable enzymes are capable of maintaining at least a portion of at least one activity after repeated exposure to temperatures from about 90°C to about 98°C for up to several minutes for each exposure. 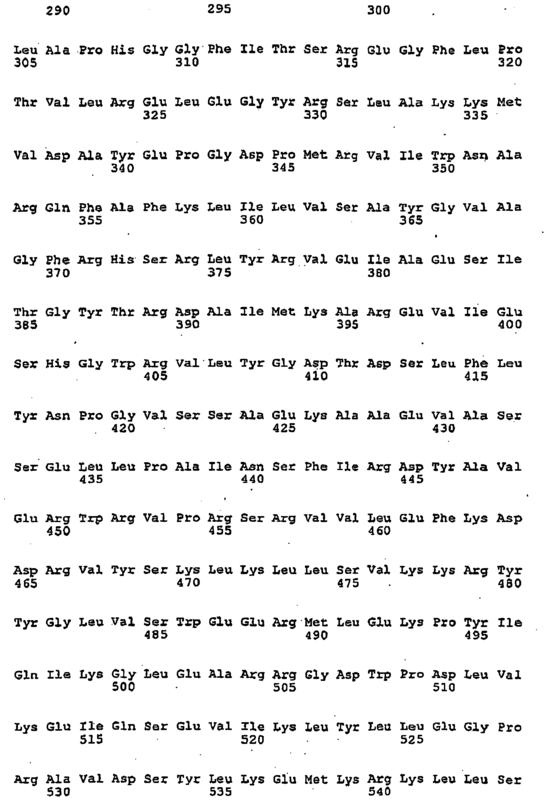 The polymerases of the invention have amino acid sequences comprising SEQ ID NO:2, SEQ ID NO:4, SEQ ID NO:6, SEQ ID NO:8, SEQ ID NO:10, SEQ ID NO:12, SEQ ID NO:14, SEQ ID NO:16, SEQ ID NO:18, SEQ ID NO:20, or may be sequence variants thereof, i.e., variants of any of the previously listed sequences. The term "sequence variants" refers to polymerases that retain at least one activity and have at least about 80% identity, more suitably at least about 85% identity, more suitably at least about 90% identity, more suitably at least about 95% identity, and most suitably at least about 98% or 99% identity, to the amino acid sequences provided. 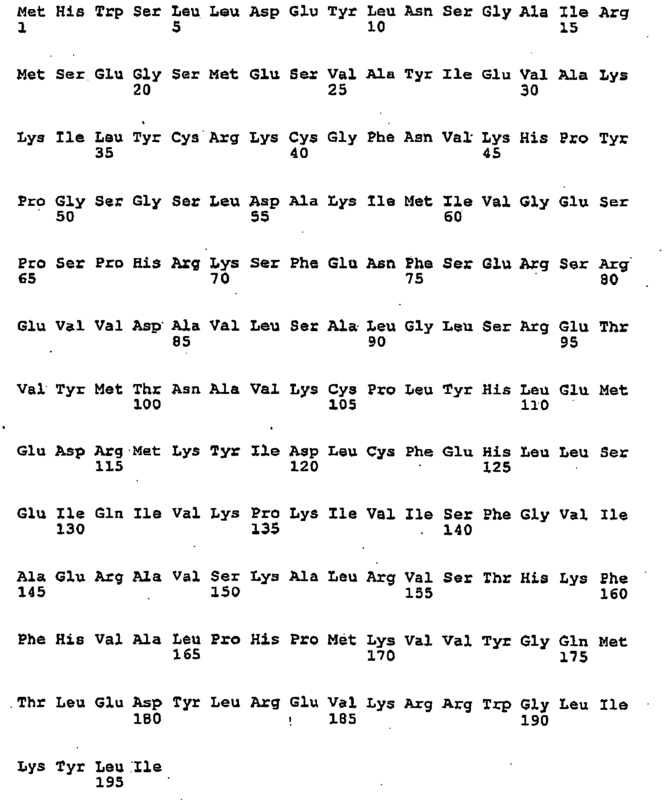 Percent identity may be determined using the algorithm of Karlin and Altschul (Proc. Natl. Acad. Sci. 87: 2264-68 (1990), modified Proc. Natl. Acad. Sci. 90: 5873-77 (1993). Such algorithm is incorporated into the BLASTx program, which may be used to obtain amino acid sequences homologous to a reference polypeptide, as is known in the art. The term "sequence variants" may also be used to refer to thermostable polymerases having amino acid sequences including conservative amino acid substitutions. Such substitutions are well known in the art. The term "sequence variants" also refers to polymerases that are subjected to site-directed mutagenesis wherein one or more substitutions, additions or deletions may be introduced, e.g., as described below, to provide altered functionality, as desired. In one particularly suitable embodiment, a polymerase of the invention includes the sequence of amino acids shown in SEQ ID NO:6. This polymerase is also referred to herein as "polymerase 3173." In other embodiments, polymerases of the invention include mutated forms of polymerase 3173, including those having sequences shown in SEQ ID NOS:25-27. The mutated forms of polymerase 3173 suitably exhibit strand displacement activity, substantially reduced exonuclease activity, reduced discrimination for nucleotide analogs, or combinations thereof, as further described below. Suitably, polymerase 3173 has a higher fidelity as compared to commercially available polymerases, e.g., VENTR (New England Biolabs). Polymerase activity may be determined by any method known in the art. Determination of activity may be based on, e.g., the activity of expending a primer on a template. For example, a labeled synthetic primer may be annealed to a template which extends several nucleotides beyond the 3' end of the labeled primer. After incubation in the presence of DNA polymerase, deoxynucleotide triphosphates, a divalent cation such as magnesium and a buffer to maintain pH at neutral or slightly alkaline, and necessary salts, the labeled primer may be resolved by, e.g., capillary electrophoresis, and detected. DNA polymerase activity may then be detected as a mobility shift of the labeled primer corresponding to an extension of the primer. In some embodiments, polymerases may substantially lack 3'-5' exonuclease activity. Suitable polymerases substantially lacking 3'-5' exonuclease activity are shown in SEQ ID NOS: 4, 8, and 14. In some embodiments, the polymerases may be subjected to site-directed mutagenesis, i.e., substitutions, additions or deletions may be introduced, to reduce or eliminate the 3'-5' exonuclease activity of the native polypeptide. Suitable mutations include those which replace charged amino acids with neutral amino acids in the exonuclease domain of the polymerase. For example, with respect to the polymerase of SEQ ID NO:6, mutations are suitably introduced in the region encompassing amino acid residue 30 to residue 190 of the native polypeptide. Suitably, one or more acidic amino acids (e.g., aspartate or glutamate) in this region are replaced with aliphatic amino acids (e.g., alanine, valine, leucine or isoleucine). Suitably, the aspartate at position 49 and/or the glutamate at position 51 of SEQ ID NO:6 is substituted. Suitably, one or both of these residues are substituted with alanine. Exemplary polymerases subjected to mutagenesis and having substantially reduced 3'-5' exonuclease activity are shown in SEQ ID NOS:25, 26, and 27. Determination of whether a polypeptide exhibits exonuclease activity, or in some embodiments, exhibits substantially reduced exonuclease activity, may be readily determined by standard methods. For example, polynucleotides can be synthesized such that a detectable proportion of the nucleotides are radioactively labeled. These polynucleotides are incubated in an appropriate buffer in the presence of the polypeptide to be tested. After incubation, the polynucleotide is precipitated and exonuclease activity is detectable as radioactive counts due to free nucleotides in the supernatant. Some polymerases of the invention, e.g., polymerase 3173 and sequence variants thereof, exhibit nick-initiated polymerase activity. As used herein, "nick-initiated polymerase activity" refers to polymerase activity in the absence of exogenous primers which is initiated by single-strand breaks in the template. In these embodiments, synthesis initiates at single-strand break in the DNA, rather than at the terminus of an exogenous synthetic primer. As will be appreciated, with nick-initiated synthesis, removal of primers is unnecessary, reducing cost, handling time and potential for loss or degradation of the product. In addition, nick-initiated synthesis reduces false amplification signals caused by self-extension of primers. Nick-initiated polymerase activity is particularly suitable for "sequence-independent" synthesis of polynucleotides. As used herein, the term "sequence-independent amplification" is used interchangeably with "whole genome amplification," and refers to a general amplification of all the polynucleotides in a sample. As is appreciated by those of skill in the art, the term "whole genome amplification" refers to any general amplification method whether or not the amplified DNA in fact represents a "genome," for example, amplification of a plasmid or other episomal element within a sample. Suitably, nick-initiated polymerase activity can be detected, e.g., on an agarose gel, as an increase in the amount of DNA product due to synthesis in the presence of a nicking enzyme as compared to minimal or no product synthesized when nicking enzyme is absent from the reaction. In some embodiments, the polymerases exhibit primer-initiated polymerase activity, and are suitable for sequence-dependent synthesis of polynucleotides. "Sequence-dependent synthesis" or "sequence-dependent amplification" refers to amplification of a target sequence relative to non-target sequences present in a sample. The most commonly used technique for sequence-dependent synthesis of polynucleotides is the polymerase chain reaction (PCR). The sequence that is amplified is defined by the inclusion in the reaction of two synthetic oligonucleotides, or "primers," to direct synthesis to the polynucleotide sequence intervening between the cognate sequences of the synthetic primers. Thermocycling is utilized to allow exponential amplification of the sequence. As used herein, sequence-dependent amplification is referred to herein as "primer-initiated." As is appreciated by those of skill in the art, primers may be designed to amplify a particular template sequence, or random primers are suitably used, e.g., to amplify a whole genome. Exemplary polymerases exhibiting primer-initiated polymerase activity have amino acid sequences comprising SEQ ID NO:2, SEQ ID NO:4, SEQ ID NO:6, SEQ ID NO:8, SEQ ID NO:10, SEQ ID NO:12, SEQ ID NO:14, SEQ ID NO:16, SEQ ID NO:18, SEQ ID NO:20, or sequence variants thereof. 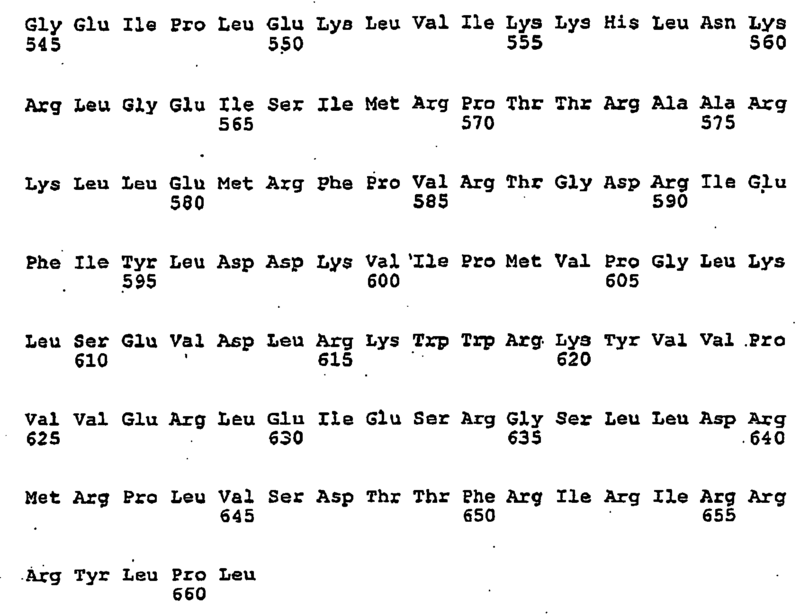 In some embodiments, the polypeptides of the invention suitably exhibit reverse transcriptase activity, as exemplified below. "Reverse transcriptase activity" refers to the ability of a polymerase to produce a complementary DNA (cDNA) product from an RNA template. Typically, cDNA is produced from RNA in a modification of PCR, referred to as reverse transcription PCR, or RT-PCR. In contrast to retroviral reverse transcriptases, e.g., those of Moloney Moloney Murine Leukemia Virus or Avian Myeloblastosis Virus, the present polymerases may be useful for both reverse transcription and amplification, simplifying the reaction scheme and facilitating quantitative RT-PCR. In contrast to bacterial DNA polymerases, e.g., that of Thermus thermophilus, inclusion of manganese in the RT-PCR reaction buffer is not required using some embodiments of the invention. As is appreciated, manganese may cause a substantial reduction in fidelity. Exemplary polymerases exhibiting reverse transcriptase activity have amino acid sequences comprising SEQ ID NQ:6, SEQ ID NO:25, SEQ ID NO:26, SEQ ID NO:27 or sequence variants thereof. The polypeptides of the invention suitably exhibit strand displacement activity. As used herein, "strand displacement activity" refers to the ability of a polymerase to displace downstream DNA encountered during synthesis. Protocols such as, e.g., strand displacement amplification (SDA) may exploit this activity. Strand displacement activity may be determined using primer-initiated synthesis. A polymerase of the invention is incubated in the presence of a plasmid and random primers. A polymerase of the invention may extend the primer the complete circumference of the plasmid at which point the 5' end of the primer is encountered. If the polymerase is capable of strand displacement activity, the nascent strand of DNA is displaced and the polymerase continues DNA synthesis. The presence of strand displacement activity results in a product having a molecular weight greater than the original template. The higher molecular weight product can be easily detected by agarose gel electrophoresis. Suitable polymerases exhibiting strand displacement activity have amino acid sequences comprising SEQ ID NO:6, SEQ ID NO:25, SEQ ID NO:26, SEQ ID NO:27 and sequence variants thereof. In some embodiments, the invention provides purified polymerases that have the ability to incorporate nucleotide analogs, i.e., polymerases that do not discriminate, or exhibit reduced discrimination, against incorporation of nucleotide analogs. Nucleotide analogs may include chain terminating analogs including acyNTPs, ddNTPs, analogs that have moieties that allow facile detection, including fluorescently labeled nucleotides, e.g., fluorescein or rhodamine derivatives, and/or combinations of chain terminators with detectable moieties, e.g., dye terminators. Nucleotide analogs may also have alternative backbone chemistries, e.g., O-methyl or 2'azido linkages, alternative ring chemistries, and/or ribonucleotide acids rather than deoxyribonucleotides. Discrimination of a polymerase for nucleotide analogs can be measured by, e.g., determining kinetics of the incorporation reaction, i.e., the rate of phosphoryl transfer and/or binding affinity for nucleotide analog. Suitably, a polymerase of the invention may have a relative incorporation efficiency of nucleotide analogs that is at least 10% of the incorporation efficiency of deoxynucleotides, i.e., in a reaction including a polymerase of the invention and equimolar amounts of nucleotide analogs and corresponding standard deoxynucleotides, the polymerase is 90% more likely to incorporate the deoxynucleotide. It is appreciated that this embodiment will be particularly suitable for use in sequencing applications, as well as detecting single nucleotide polymorphisms. In other embodiments, the incorporation of nucleotide analogs may aid in the detection of specific sequences by hybridization, e.g., in microarrays, by altering nuclease susceptibility, hybridization strength, selectivity or chemical functionality of a synthetic polynucleotide. Suitably, polymerases of the invention have a relative incorporation efficiency of nucleotide analogs at least about 10% of the incorporation efficiency of standard deoxynucleotides, more suitably at least about 20% incorporation efficiency of standard deoxynucleotides, more suitably at least about 50% incorporation efficiency of standard deoxynucleotides, more suitably at least about 75% incorporation efficiency of standard deoxynucleotides still more suitably at least about 90% incorporation efficiency of standard deoxynucleotides and most suitably at least about 98-99% incorporation efficiency of standard deoxynucleotides. Suitable polymerases capable of incorporating nucleotide analogs include sequence variants of the polymerases described herein, wherein the polymerase is mutated in the dNTP binding domain to reduce discrimination against chain terminating analogs. As is known in the art, the dNTP binding domain of most polymerases may be characterized as having the sequence K N1 N2 N3 N4 N5 N6 N7 Y G/Q, wherein N1-N7 are independently any amino acid and N7 may or may not be present, depending on the polymerase. Most suitably, a substitution is introduced at N4 of the dNTP binding domain. Most suitably, the amino acid at position N4 is substituted to tyrosine or a functionally equivalent amino acid that may be chosen by routine experimentation. As an example, a substitution may be made at an amino acid position corresponding to amino acid position 418 of polymerase 3173. Suitably, the phenylalanine natively present at position 418 of polymerase 3173 is replaced with tyrosine ("F418Y"). Most suitably, the polymerases exhibit substantially reduced discrimination between chain terminating nucleotides (e.g., nucleotide analogs) and their native counterparts, as shown in the examples. In some cases, a polymerase discriminates 50 fold less, or 100 fold less, or 500 fold less, or 1000 fold less than its native counterpart. In other embodiments, the polymerase is a double mutant. 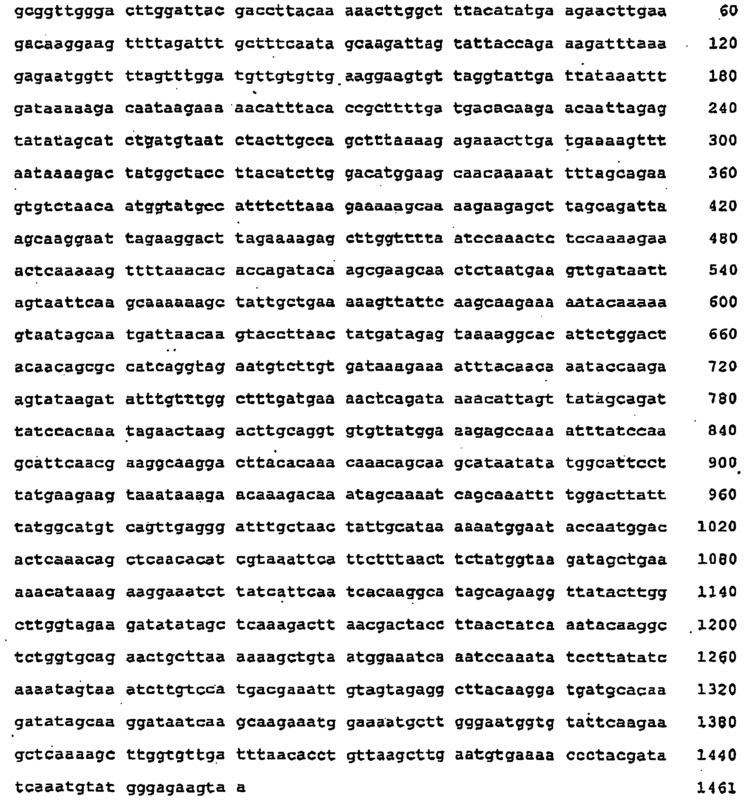 Suitably, the native polypeptide of SEQ ID NO:6 may have one mutation in the region encompassing amino acid residue 30 to residue 190 of the native polypeptide sequence and a second mutation at amino acid position 418. Suitably, the double mutant exhibits both reduced exonuclease activity, as described above, and reduced discrimination for incorporation of nucleotide analogs. One example of a double mutant of polymerase 3173 has both a D49A and a F418Y mutation, and its sequence is shown in SEQ ID NO:27. The invention further provides compositions including polymerases of the invention. In some embodiments, compositions of the invention include one or more polymerases selected from SEQ ID NO:2, SEQ ID NO:4, SEQ ID NO:6, SEQ ID NO:8, SEQ ID NO:10, SEQ ID NO:12, SEQ ID NO:14, SEQ ID NO:16, SEQ ID NO:18, SEQ ID NO:20, SEQ ID NO:25, SEQ ID NO:26, SEQ ID NO:27 and sequence variants thereof. In a particular embodiment, the composition comprises SEQ ID NO:6 and one or more polymerases selected from SEQ ID NO:25, SEQ ID NO:26, SEQ ID NO:27. and sequence variants thereof. In other embodiments, polymerases of the invention can be included in a composition with other commercially available polymerases. Some embodiments of the invention provide isolated polynucleotides encoding the polymerases. The term "isolated polynucleotide" is inclusive of, for example: (a) a polynucleotide which includes a coding sequence of a portion of a naturally occurring genomic DNA molecule that is not flanked by coding sequences that flank that portion of the DNA in the genome of the organism in which it naturally occurs; (b) a polynucleotide incorporated into a vector or into the genomic DNA of a prokaryote or eukaryote in a manner such that the resulting molecule is not identical to any naturally occurring vector or genomic DNA; and (c) a cDNA molecule, a genomic fragment, a fragment produced by polymerase chain reaction, or a restriction fragment. A "vector" is any polynucleotide entity capable of being replicated by standard cloning techniques. Suitable polynucleotides encoding a polymerase of the invention have the nucleotide sequence shown in SEQ ID NO:1, SEQ ID NO:3, SEQ ID NO:5, SEQ ID NO:7, SEQ ID NO:9, SEQ ID NO:11, SEQ ID NO:13, SEQ ID NO:15, SEQ ID NO:17 or SEQ ID NO:19. The invention also provides DNA constructs useful in preparing the polypeptides of the invention. The DNA constructs include at least one polynucleotide encoding the polypeptides described herein, operably connected to a promoter. The promoter may be natively associated with the coding sequence, or may be heterologous. Suitable promoters are constitutive and inducible promoters. A "constitutive" promoter is a promoter that is active under most environmental and developmental conditions. An "inducible" promoter is a promoter that is under environmental or developmental regulation. The term "operably connected" refers to a functional linkage between a promoter and a second nucleic acid sequence, wherein the promoter directs transcription of the nucleic acid corresponding to the second sequence. The constructs may suitably be introduced into host cells, such as E. coli or other suitable hosts known in the art, for producing polymerases of the invention. Expression systems are well known in the art. The present invention further provides a method of synthesizing a copy or complement of a polynucleotide template. The method includes a step of contacting the template with a polypeptide of the invention under conditions sufficient to promote synthesis of the copy or complement. In some embodiments, the template is RNA. In other embodiments, the template is DNA. A copy or complement of a polynucleotide template may be synthesized using a polymerase of the invention in a thermocycled reaction, e.g., PCR, RT-PCR, or alternatively, using substantially isothermal conditions. As used herein, "substantially isothermal" refers to conditions that do not include thermocycling. Due to their thermostability, the present polypeptides may prove particularly useful in, e.g., strand-displacement amplification (SDA), loop-mediated isothermal amplification (LAMP), rolling circle amplification (RCA) and/or multiple displacement amplification (MDA). Using these techniques, nucleic acids from clinical isolates containing human cells can be amplified for genotyping. Nucleic acids from clinical isolates containing viruses or bacterial cells can be amplified for pathogen detection. Nucleic acids from microbial cells, which may be very difficult to isolate in large quantities, may be amplified for gene mining or enzyme or therapeutic protein discovery. In some methods of the invention, amplification is carried out in the presence of at least one primer pair, e.g., to amplify a defined target sequence. In other embodiments, random primers are added to promote sequence-independent amplification. In still further embodiments, primers are excluded, and a nick-inducing agent is optionally added to facilitate polymerase activity. A "nick-inducing agent" is defined herein as any enzymatic or chemical reagent or physical treatment that introduces breaks in the phosphodiester bond between two adjacent nucleotides in one strand of a double-stranded nucleic acid. The nicks may be introduced at defined locations, suitably by using enzymes that nick at a recognition sequence, or may be introduced randomly in a target polynucleotide. Examples of nick-inducing enzymes include Nb.Bpu10I (Fermentas Life Sciences), Nt.BstNB I, Nt.Alw I, Nb.BbvC I, Nt.BbvC I, Nb.Bsm I, Nb.BsrD (New England Biolabs) and E. coli endonuclease I. Due to their unique biochemical properties, the polymerases of the present invention may be particularly suitable for amplifying sequences that are traditionally difficult to amplify. 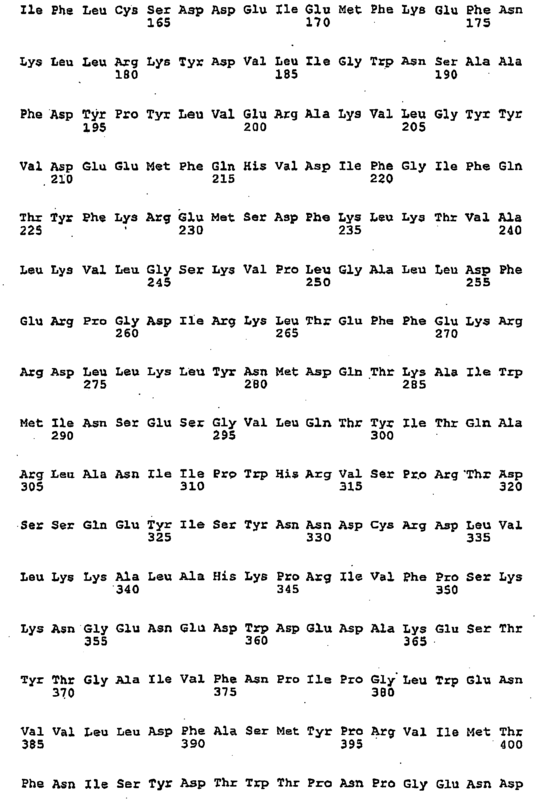 These sequences are referred to herein as "amplification-resistant sequences." For example, some difficult sequences have inverted repeats in their sequences that promote the formation of DNA secondary structure. Others have direct repeats that cause the nascent strand to spuriously re-anneal and cause incorrect insertion or deletion of nucleotides. In other cases, amplification-resistant sequences have a high content of guanine and cytosine (G + C) or, conversely, a high content of adenine and thymidine (A + T) residues. A sequence has a high content of G + C or A + T when at least about 65% of the sequence comprises those residues. In some embodiments, a sequence is considered amplification- resistant when the desired product is at least about 2kb. 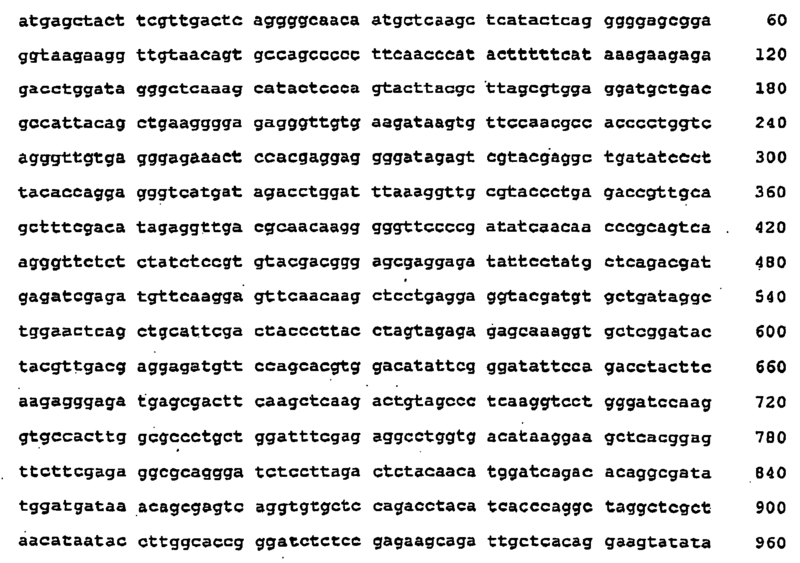 In some cases, polymerases of the invention can amplify sequences that are larger than the normal range of PCR, i.e., around 10 kb, as exemplified below. The polymerases of the invention may be characterized by their thermostability, temperature optimum, fidelity of incorporation of nucleotides, cofactor requirements, template requirements, reaction rate, affinity for template, affinity for natural nucleotides, affinity for synthetic nucleotide analogs and/or activity in various pHs, salt concentrations and other buffer components. As will be appreciated by the skilled artisan, an appropriate polymerase, or combination of polymerases, may be selected based on any of these characteristics or combinations thereof, depending on the application of interest. The following examples are provided to assist in a further understanding of the invention. The particular materials and conditions employed are intended to be further illustrative of the invention and are not limiting upon the reasonable scope of the appended claims. EXAMPLES Example 1. Isolation of uncultured viral particles from a thermal spring. Viral particles were isolated from a thermal spring in the White Creek Group of the Lower Geyser Basin of Yellowstone National Park (N 44.53416, W 110.79812; temperature 80°C, pH 8), commonly known as Octopus Spring. Thermal water was filtered using a 100 kiloDalton molecular weight cut-off (mwco) tangential flow filter (A/G Technology, Amersham Biosciences) at the rate of 7 liters per minute for over 90 minutes (630 liters overall), and viruses and microbes were concentrated to 2 liters. The resulting concentrate was filtered through a 0.2 µm tangential flow filter to remove microbial cells. The viral fraction was further concentrated to 100 ml using a 100 kD tangential flow filter. Of the 100 ml viral concentrate, 40 ml was processed further. Viruses were further concentrated to 400 µl and transferred to SM buffer (0.1 M NaCl, 8 mM MgSO4, 50 mM TrisHCl 7.5) by filtration in a 30 kD mwco spin filter (Centricon, Millipore). Example 2. Isolation of viral DNA. Serratia marcescens endonuclease (Sigma, 10 U) was added to the viral preparation described in Example 1 to remove non-encapsidated (non-viral) DNA. The reaction was incubated for 30 min. at 23°C. Subsequently, EDTA (20 mM) and sodium dodecyl sulfate (SDS) (0.5%) was added. To isolate viral DNA, Proteinase K (100 U) was added and the reaction was incubated for 3 hours at 56°C. Sodium chloride (0.7M) and cetyltrimethylammonium bromide (CTAB) (1%) were added. The DNA was extracted once with chloroform, once with phenol, once with a phenol:chloroform (1:1) mixture and again with chloroform. The DNA was precipitated with 1 ml of ethanol and washed with 70% ethanol. The yield of DNA was 20 nanograms. Example 3. Construction of a viral DNA library. 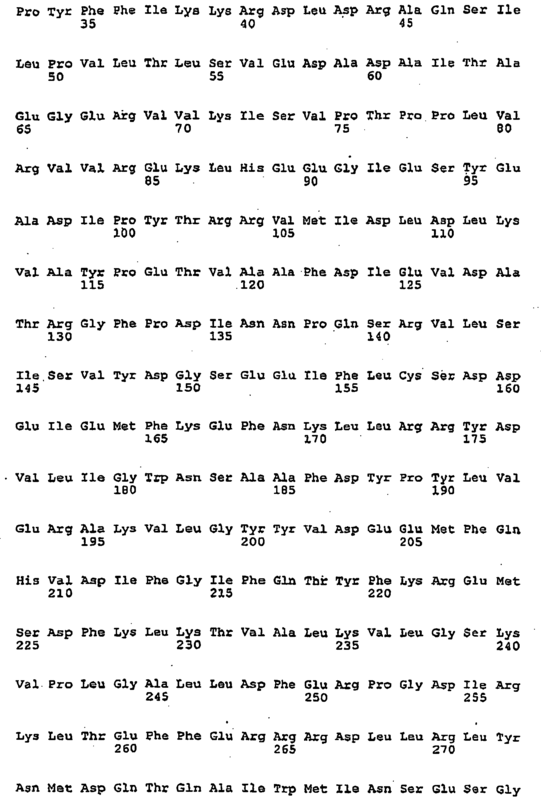 Ten nanograms of viral DNA isolated as described in Example 2 was physically sheared to between 2 and 4 kilobases (kb) using a HydroShear Device (Gene Machines). 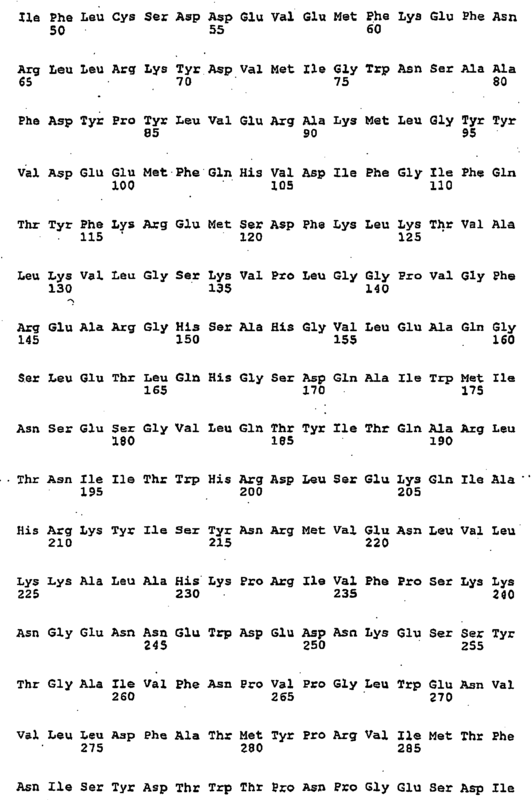 These fragments were ligated to double-stranded linkers having the nucleotide sequences shown in SEQ ID NOS:21 and 22 using standard methods. The ligation mix was separated by agarose gel electrophoresis and fragments in the size range of 2-4 kb were isolated. 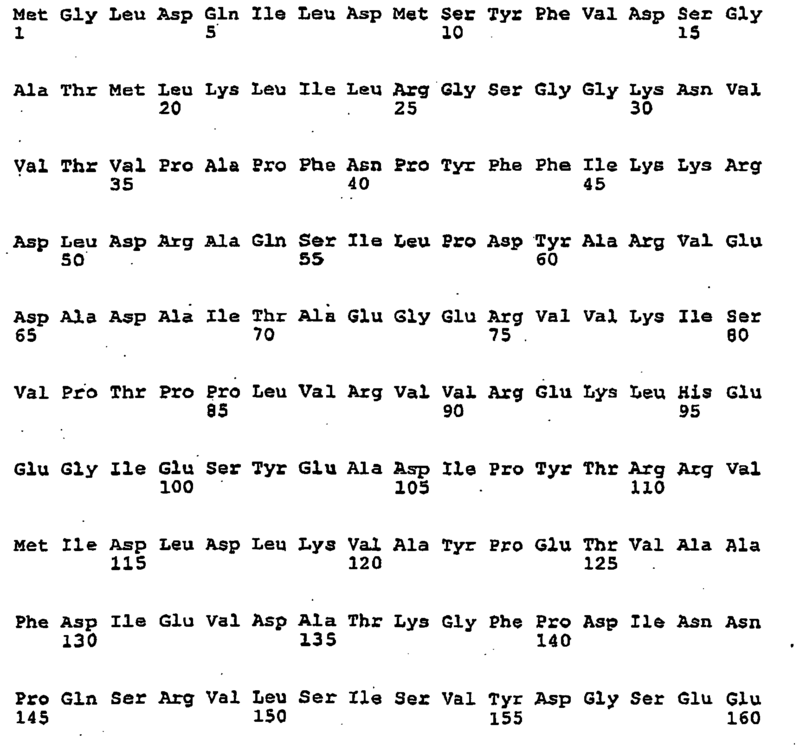 These fragments were amplified by standard PCR methods. The amplification products were inserted into the cloning site of pcrSMART vector (Lucigen, Middleton, WI) and used to transform E. CLONI 10G cells (Lucigen, Middleton, WI). Example 4. Screening by sequence similarity. 21,797 clones from the library described in Example 3 were sequenced using standard methods. 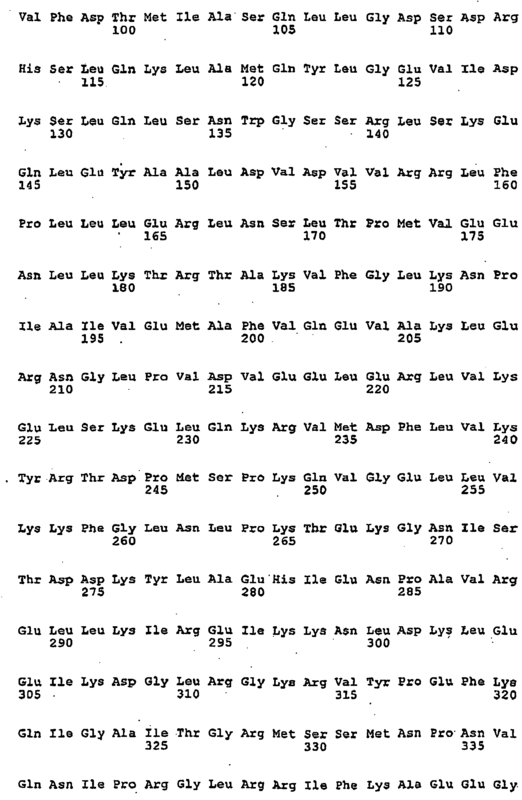 These sequences were conceptually translated and compared to the database of non-redundant protein sequences in GenBank (NCBI) using the BLASTx, program (NCBI). 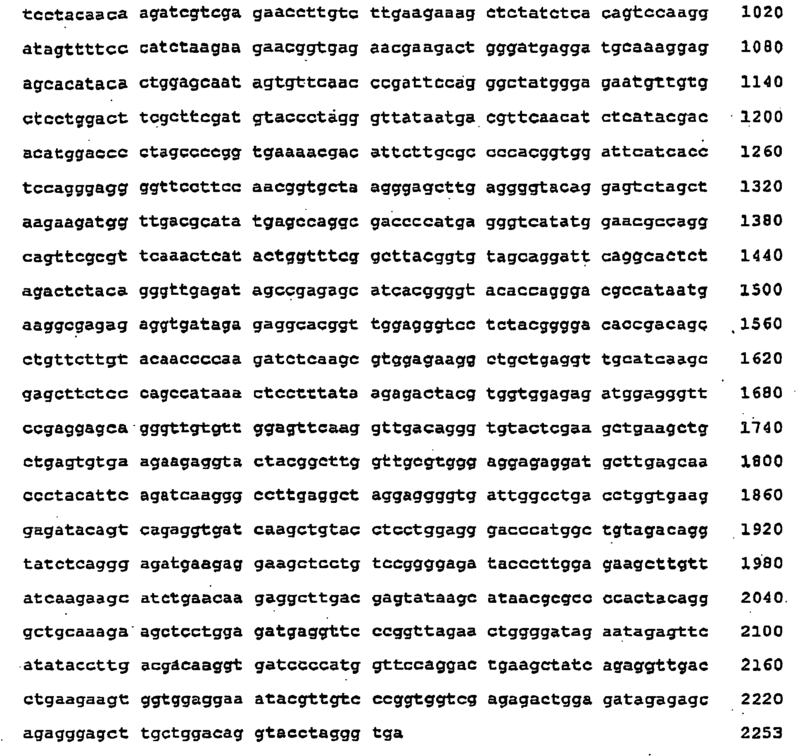 Of these, 9,092 had significant similarity to coding sequences of known proteins in the database. 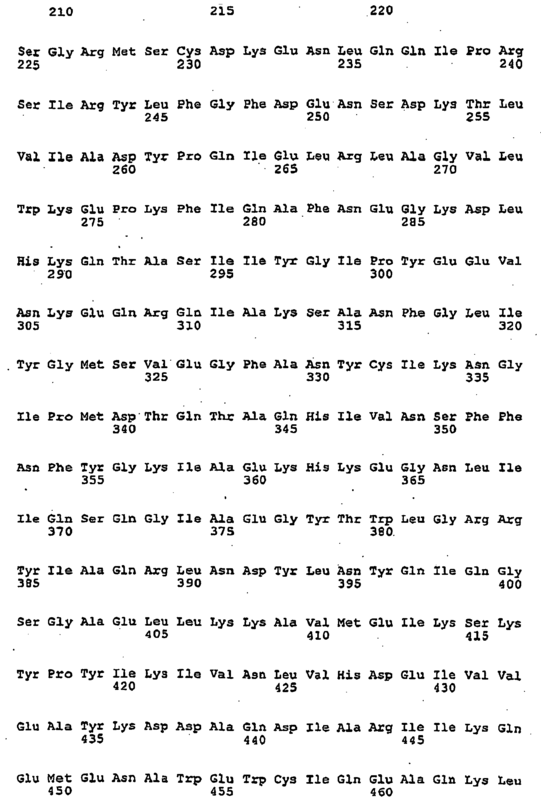 2,036 had similarity to known viral coding sequences. 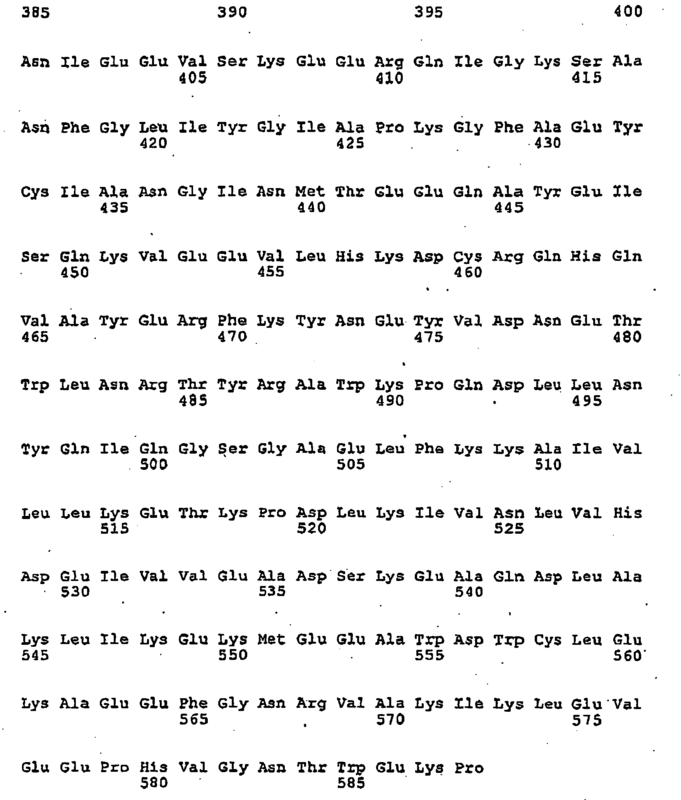 148 had at least partial similarity to known DNA polymerase coding sequences. 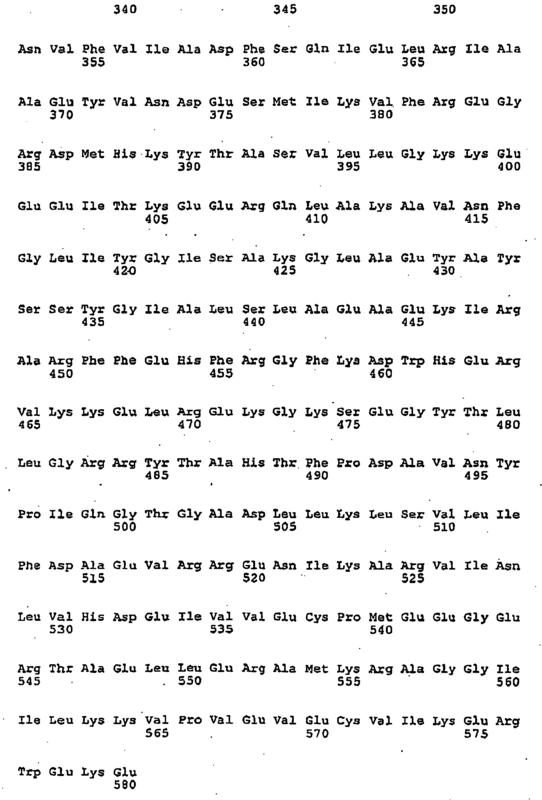 34 appear to be complete polymerase coding sequences. Example 5. Expression of DNA polymerase genes. 34 complete polymerase genes from the library described in Examples 3 and 4, as well as 24 additional viral genes from three other similarly prepared libraries, were constitutively expressed in the E. CLONI 10G cells (Lucigen, Middleton, WI). The proteins were extracted, heated to 70°C for 10 minutes and tested for DNA polymerase activity using a primer extension assay as follows. 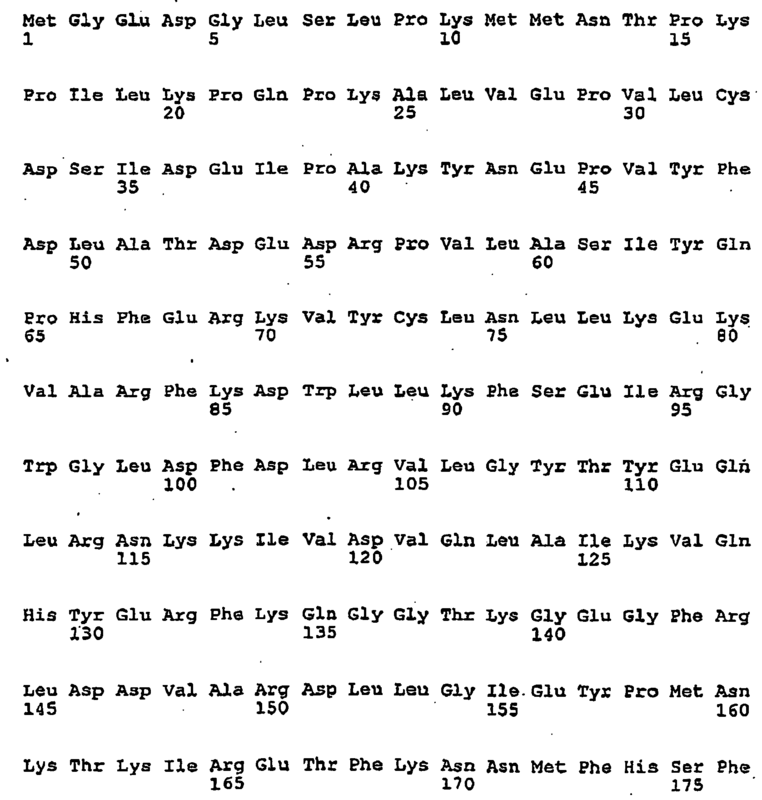 A primer of 37 nucleotides having the sequence shown in SEQ ID NO:23, labeled on its 5' end with ROX, was annealed to a template of 41 nucleotides having the sequence shown in SEQ ID NO:24. Proteins extracted as described above and template were added to 20 mM Tris-HCl, 10 mM (NH4)2SO4, 10 mM KCl, 2 mM MgSO4, 0.1 % Triton X-100, pH 8.8 @ 25°C, and 250 µM each of deoxycytidine triphosphate (dCTP), deoxyadenine triphosphate (dATP), deoxyguanidine triphosphate (dGTP), and thymidine triphosphate (TTP). The reaction was incubated at 70°C for 10 minutes. The reactions were analyzed using an ABI 310 Genetic Analyzer. Extension of the primer resulted in a mobility shift corresponding to an extension of 4 nucleotides that was detectable by the ABI 310 Genetic Analyzer. Of the 58 clones tested, a total of ten clones expressed detectable DNA polymerase (DNAP) activity. The clone number and corresponding polynucleotide sequence, polypeptide sequence, sequence similarity and E (expect)-values for these polymerases are shown below in Table 1. The presence of exonuclease activity, either 3'-5' or 5'-3', resulted in a reaction product migrating at less than 37 nucleotides during capillary electrophoresis. Table 1. Example 6. Purification and characterization of viral DNA polymerase identified in the viral libraries. As determined by sequence similarity screening described in Example 4, the polynucleotide having the sequence of nucleotides shown in SEQ ID NO:5 included regions having significant similarity to several dozen sequences encoding bacterial DNA polymerase I. 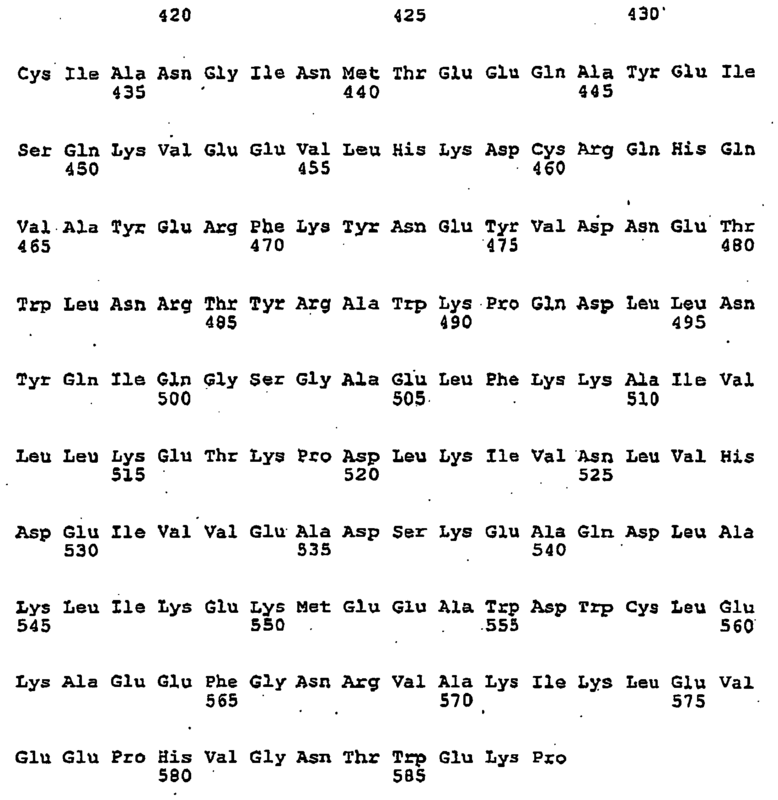 The E value for the complete gene was as low as 2x10-37, indicating a very high probability that the sequence is that of an authentic DNA polymerase gene. 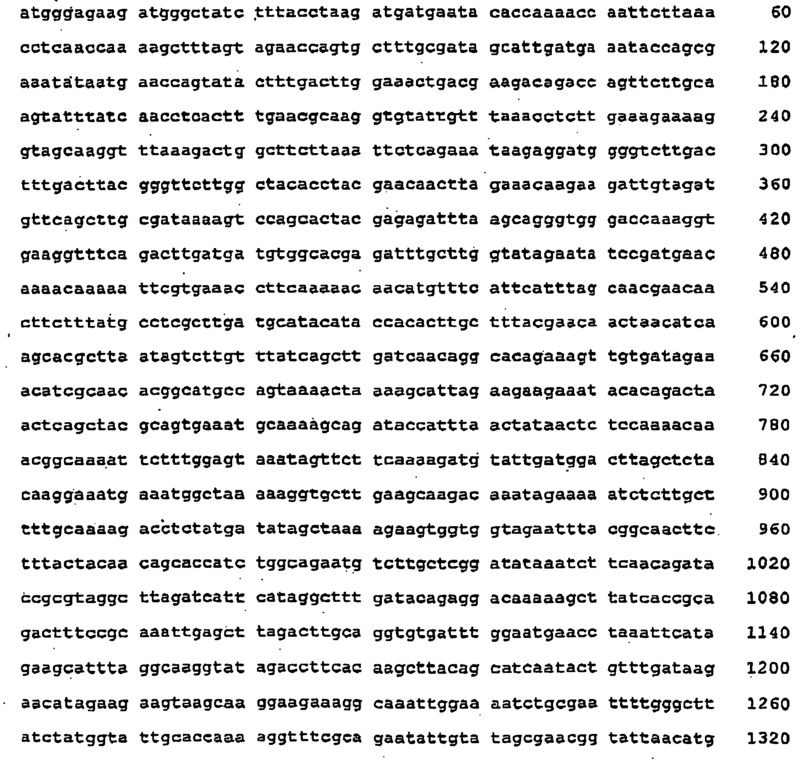 This coding sequence was transferred to a tac-promoter based expression vector (Lucigen) and used to produce high levels of thermostable DNA polymerase in E. CLONI 10G cells according to the manufacturer's recommendations (Lucigen). The protein was purified by column chromatography. Counts of >1,000 cpm were detected compared to a typical background of <100 cpm, confirming the presence of DNA polymerase activity. Example 7. Production of exonuclease deficient polymerase 3173 mutants. The presence of a 3'-5' exonuclease domain in the 3173 DNA polymerase was detected by reduction in molecular weight of a 5' fluorescently labeled oligonucleotide. Upon incubation of the primer/template complex described in Example 5, under the same conditions, a portion of the primer product was reduced in apparent molecular weight. This reduction in size was detected by capillary electrophoresis using an ABI 310 Genetic Analyzer operated in GeneScan mode. The presence of an exonuclease domain was confirmed by sequence alignment and by incubation of the polymerase with a radiolabeled polynucleotide, followed by digestion and precipitation with trichloroacetic acid. Radioactivity due to free nucleotides in the supernatant was measured. Based on sequence alignments comparing polymerase 3173 with sequences identified in NCBI conserved domain database cdd.v2.07 (publicly available), an active site and apparent metal chelating amino acids (amino acids D49 and E51) were identified. Based on this information, two mutants of polymerase 3173 were produced. One mutant, D49A, was the result of a mutation of the aspartic acid at position 49 of the wild-type protein to alanine. 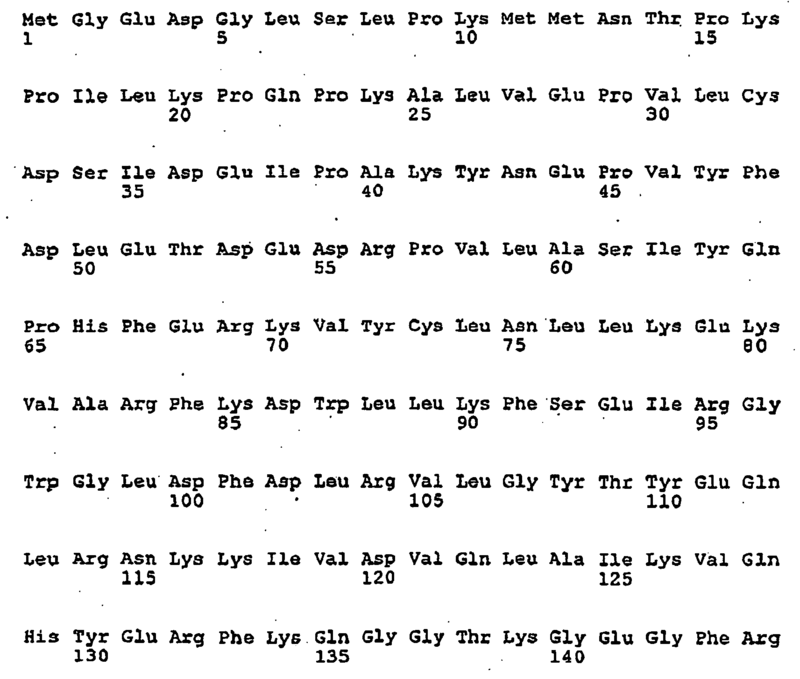 The second mutant, E51A, was the result of a mutation of the glutamic acid at position 51 of the native protein to alanine. Mutants D49A and E51 A were produced using standard methods. An exonuclease assay was performed to confirm that exonuclease activity was eliminated in the mutants. Each of mutants D49A and E51A were tested for exonuclease activity using the radioactive nucleotide release assay described above, which is capable of detecting exonuclease activity levels below 0.1% of wild-type. Wild-type polymerase 3173 exhibited potent nuclease activity, whereas neither mutant exhibited detectable nuclease activity. Example 8: Processivity of polymerase 3173 mutant D49A. where I = intensity of each peak, n = number of nt added. The processivity for polymerase 3173 D49A was determined to be 47nt. Example 9. 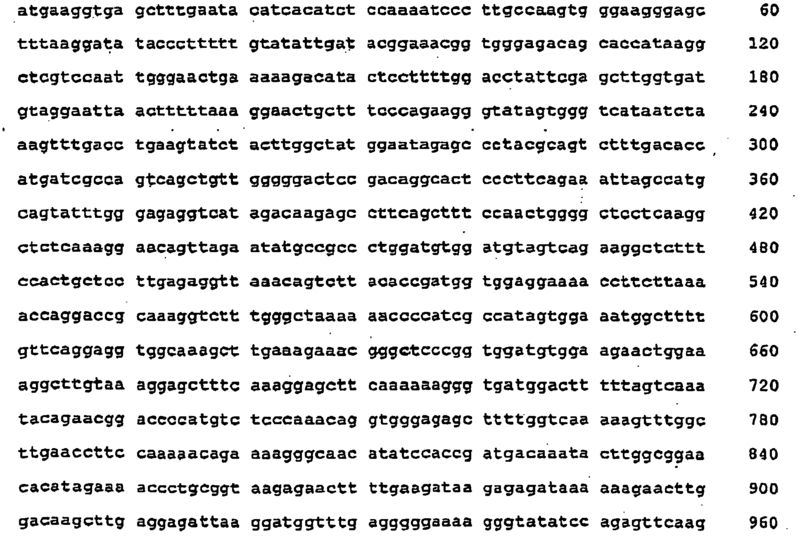 Characterization of polymerase 3173. Exonuclease activity for polymerase 3173 was determined as described in Example 7. 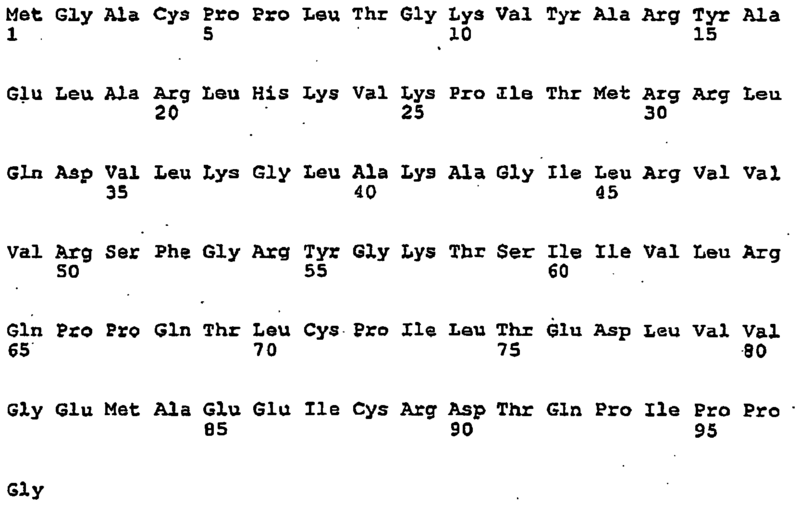 The binding constant (reported as Km, the concentration at which the reaction rate is 50% maximal) for nucleotides by polymerase 3173 was determined using activated calf thymus DNA as a template. Reactions were maintained under pseudo-first order conditions using a molar excess of all components, with the exceptions of the enzyme and the nucleotides. Reactions (50 µl) were incubated at 70°C and samples (5 µl each) were removed at varying time points and spotted on DE81 paper. Activity was determined as described in Example 6. The binding constant for primed template was similarly determined except that nucleotides were supplied in excess and the concentration of primed template (primed single stranded M13 DNA) was varied. Results are tabulated below. Thermostability (T½ at 95°) 10 min. Strand displacement activity was determined using primer-initiated synthesis in a rolling circle amplification (RCA) protocol. Briefly, polymerase 3173 was incubated in the presence of a plasmid and random primers. Polymerase 3173 extended the primer the complete circumference of the plasmid at which point the 5' end of the primer was encountered. Polymerase 3173 displaced the nascent strand of DNA and continued DNA synthesis. The presence of strand displacement activity resulted in a product having a molecular weight greater than the original template. As shown in FIGs. 5 and 6, the higher molecular weight product was easily detected by agarose gel electrophoresis. Fidelity was determined as described in example 10. Example 10. High fidelity PCR using polymerase 3173. Fidelity was determined by a modification of the standard assay in which the lacIq gene is amplified by the DNA polymerase of interest and inserted into a plasmid containing genes encoding a functional lacZ alpha peptide and a selectable marker. 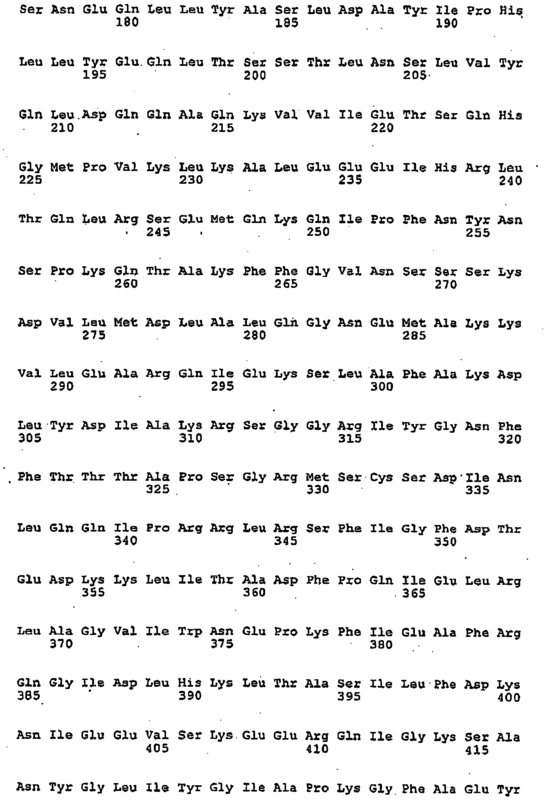 Primers of SEQ ID NOS:28 and 29 were used to amplify a sequence containing both the lacIq and the KanR gene. Insertion of this gene into the Eco109I site of pUC19 resulted in double resistance to kanamycin and ampicillin. Normally a white phenotype is seen for clone containing this construct when plated on X-Gal. Mutation of the lacIq results in a blue phenotype for the colonies when plated on X-Gal. The wild-type (proofreading) DNA polymerase 3173 and its exonuclease deficient derivatives, E51A and D49A, and, for comparison, two standard DNA polymerases, Taq and VENTR DNA polymerases, were tested. For high fidelity PCR amplification, five units of the wild-type (proofreading) DNA polymerase 3173 (SEQ ID NO: 6) was tested using the following mix (50 mM Tris HCl (pH 9.0 at 25°C), 50 mM KCl, 10 mM (NH4)2SO4, 1.5 mM MgSO4, 1.5 mM MgCl2, 0.1% triton-X100, 250 mM ectoine and 0.2 mM each of dGTP, dATP, dTTP and dCTP. Opposing primers of SEQ ID 28 and 29 (1 µM each) amplified the expected 2k kb product from template SEQ ID 30 (10 ng). After thermal cycling (94°C for 1 minute, 25 cycles of (94°C for 15 seconds, 60°C for 15 seconds, 72°C for 2.5 minutes) and 72°C 7 minutes), reaction products were quantified to determine "fold amplification," (see below) using agarose gel electrophoresis. Both primers contain Eco109I sites. The PCR product was digested with Eco109I and inserted into the Eco109I site of pUC19. 10 G cells transformed by the construct were plated on LB plates containing ampicillin (100 µg/ml), kanamycin (30 µg/ml) and X-Gal (50 µg/ml). Blue and white colony counts were used for the fidelity determinations. For comparison, polymerase 3173 exonuclease deficient mutants, E51A and D49A and, two standard DNA polymerases, Taq and VENTR DNA polymerases, were tested in the same manner. Example 11. Polymerase chain reaction using polymerase 3173 mutant D49A. Primers specific for the bla gene of pUC19 were used to amplify a 1 kb product using polymerase 3173 mutant D49A and commercial enzymes for comparison. The polymerase chain reactions included 50 mM Tris HCl (pH 9.0 at 25°C), 50 mM KCl, 10 mM (NH4)2SO4, 1.5 mM MgSO4, 1.5 mM MgCl2, 0.1% triton-X100, 0.02 mg/ml bovine serum albumin, 250 mM ectoine and 0.2 mM each of dGTP, dATP, dTTP and dCTP. Opposing primers annealing 1 kb apart in the bla gene of the pUC19 plasmid and the D49A mutant polymerase were added. After thermal cycling (25 cycles of 94°C for 15 seconds, 60°C for 15 seconds, 72°C for 60 seconds), reactions were resolved using agarose gel electrophoresis. The results are shown in FIG. 1. 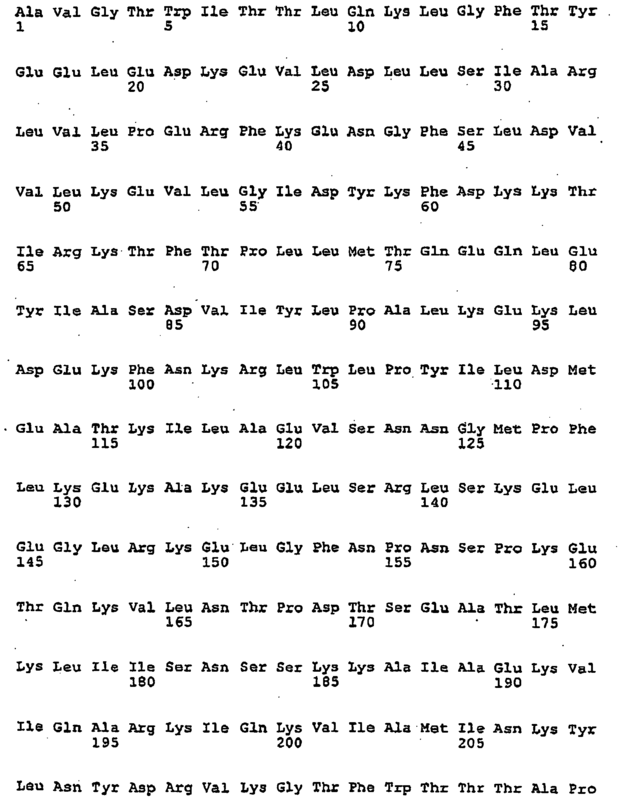 Lanes are as follows: no template DNA (lane 2) or 40 nanograms of pUC19 DNA (lanes 3-8); no enzyme (lanes 2 and 3), 2, 4 or 8 Units of polymerase 3173 mutant D49A (P, lanes 4, 5 and 6, respectively), 5 U VENTR (V, NEB, lane 7) or 5 U Taq DNA polymerase (T, Lucigen, lane 8). 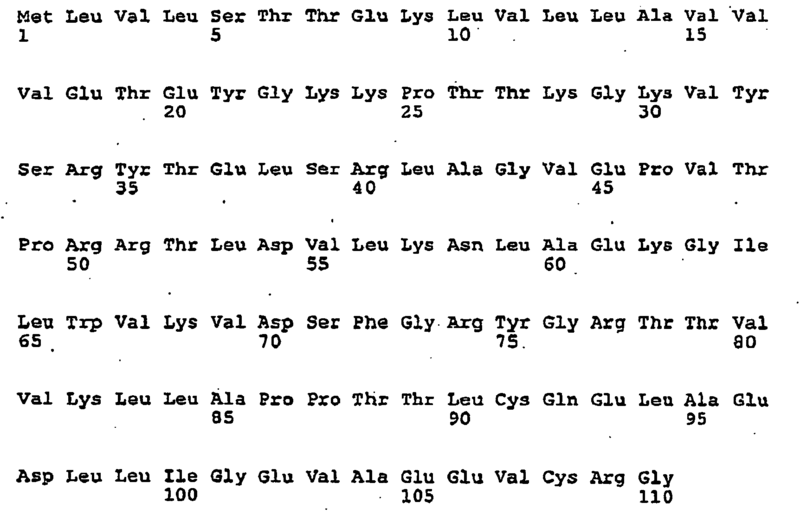 Also shown are molecular weight markers (lane 1). As seen in FIG. 1, PCR amplification using the D49A mutant resulted in a product of the predicted size, similar to commercially available enzymes. Example 12. Polymerase chain reaction using polymerase 3173 and polymerase 3173 mutant E51A. A range of mixes of polymerase 3173 and polymerase 3173 mutant E51A (1:5, 1:25, 1:100, 1:500 U/U), and primers of SEQ ID NO:28 and SEQ ID NO:29, were used to amplify a 2259 nucleotide region of a circular synthetic template. The amplification mix, comprised of 50 mM Tris HCl (pH 9.0 at 25°C), 50 mM KCl, 10 mM (NH4)2SO4, 1.5 mM MgSO4, 1.5 mM MgCl2, 0.1% triton-X100, 15% sucrose, 0.2 mM each of dGTP, dATP, dTTP and dCTP, 1µM of each opposing primer and 20 ng of template, was incubated under the following conditions: 94°C for 2 minutes, 25 cycles of (94°C for 15 seconds, 69°C for 15 seconds, 72°C for 2 minutes) and 72°C for 10 minutes. The amplification reaction resulted in product migrating at the expected molecular weight with no extraneous products as seen in Fig. 2. The cyc gene from a Bacillus stearothermophilus isolate had proven to be an amplification-resistant sequence by all commercially available DNA polymerases that were tested. This sequence was amplified using polymerase 3173 mutant D49A using the conditions described in Example 10. For comparison, amplification of this gene by other commercially available DNA polymerases including Taq, Phusion (Finnzymes), VENTR, Tfl (Promega), KOD (TaKaRa) was also conducted according to each manufacturers' recommendations. The results are shown in FIG. 3. Lanes are as follows: Taq (lanes 2-4), Phusion (lanes 5-7), VENTR (lanes 8-10), Tfl (lanes 11-13), KOD (lanes 14-16) and polymerase 3173 mutant D49A (lanes 17-19). Amplification products were resolved by agarose gel electrophoresis and imaged using standard methods. The predicted amplification product comigrates with the 1 kb marker (lanes 1 and 20). Negative control reaction lacking template (lanes 2, 5, 8, 11, 14 and 17) or enzyme (lanes 3, 6, 9, 12, 15 and 18) are also shown in FIG. 3. As shown in FIG. 3, amplification was observed using commercially available enzymes, as well as the D49A mutant, however, none of these commercially available enzymes resulted in the exceptionally high yields generated using mutant D49A. Example 14. Reverse transcriptase activity and RT-PCR using polymerase 3173 and polymerase 3173 mutants. Reverse transcriptase activity was detected by incorporation of radiolabeled deoxyribonucleotide triphosphates into polydeoxyribonucleotides using a ribonucleic acid template. A reaction mix comprising 50mM Tris-HCl pH 8.3 at 25°C, 75mM KCl, 3mM MgCl2, 2mM MnCl2, 200 µM dTTP, 0.02 mg/ml Poly rA: Oligo dT (Amersham), and 10 µCi of [P-32] alpha dTTP was incubated with 1 U of polymerase 3173 or the polymerase 3173 mutant D49A at 60°C for 20 minutes. Incorporation of dTTP was detected as radioactive counts adhering to DE81 filter paper. Similar reverse transcription reactions were measured by incorporation of labeled dTTP on a poly rA template using 1 unit of Tth (Promega) and 1 unit MMLV reverse transcriptase (Novagen) according to the respective manufacturers' recommended conditions. 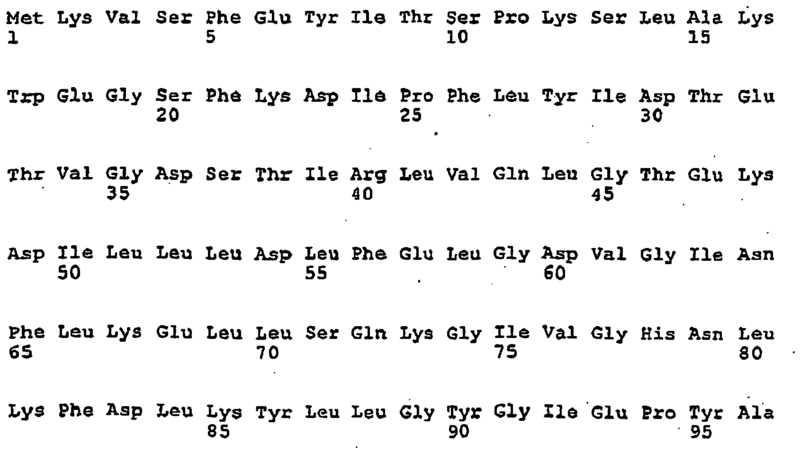 Incorporation rates of polymerase 3173 and mutant D49A in comparison to commercially available enzymes are tabulated below. In addition, in contrast to the manganese-dependent activity of Tth, reverse transcription by polymerase 3173 and mutant D49A is equivalent when reactions are run in the presence of either manganese or magnesium. Next, a 50 µl reaction containing 20 mM Tris-HCl (pH 8.8 at 25°C), 10 mM (NH4)2SO4, 10 mM KCl, 2 mM MgSO4, 0.1 % Triton X-100, 0.25M ectoine, 200 µM each of dGTP, dATP, dTTP and dCTP, 1 µg of total mouse liver RNA (Ambion), 0.4 µM of primers from the QuantumRNA β-actin Internal Standards kit (Ambion) and 5 units of polymerase 3173 mutant E51A DNA polymerase was incubated under the following temperature cycle: 60° for 60 minute, 94°C for 2 minutes, 35 cycles of (94°C for 15 seconds, 57°C for 15 seconds, 72°C for 1 minute), followed by 72°C for 10 minutes. The primers are predicted to direct synthesis of a 294 base-pair product. Five µl of the reaction was analyzed by agarose gel electrophoresis. As shown in FIG. 4, a prominent band was observed migrating at the predicted molecular weight; no other bands were observed. Five units of polymerase 3173 was used to amplify one nanogram each of single-stranded M13mp18 and double stranded pUC19 plasmid DNA. Reactions container 20 mM Tris-HCl, 10 mM (NH4)2SO4, 10 mM KCl, 2 mM MgSO4, 0.1 % Triton X-100, pH 8.8 at 25°C, and 250 µM each of dGTP, dATP, dTTP and dCTP. 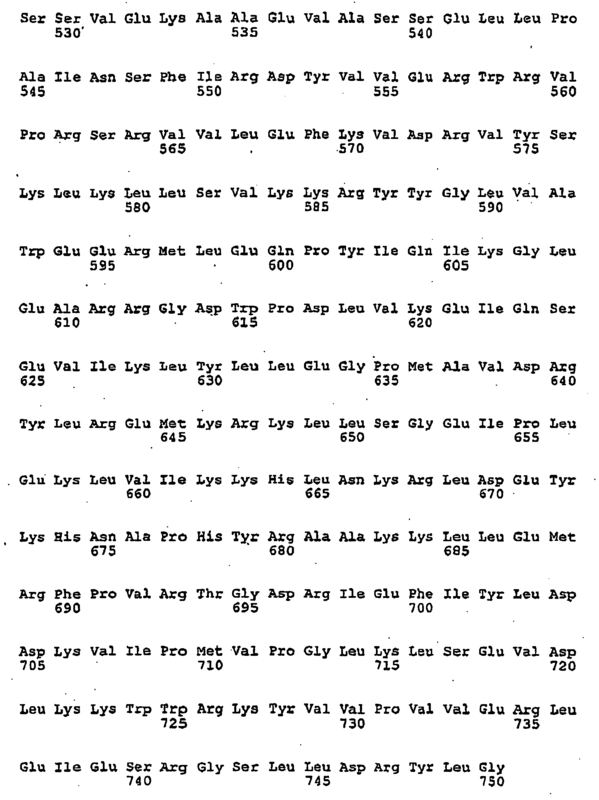 Either 0.5µM or 5µM of random decamer primers were added to each template. Reactions were incubated at 95°C prior to addition of enzyme, then 16 hours at 55°C with enzyme. One fiftieth of each reaction was resolved on a 1% agarose gel. 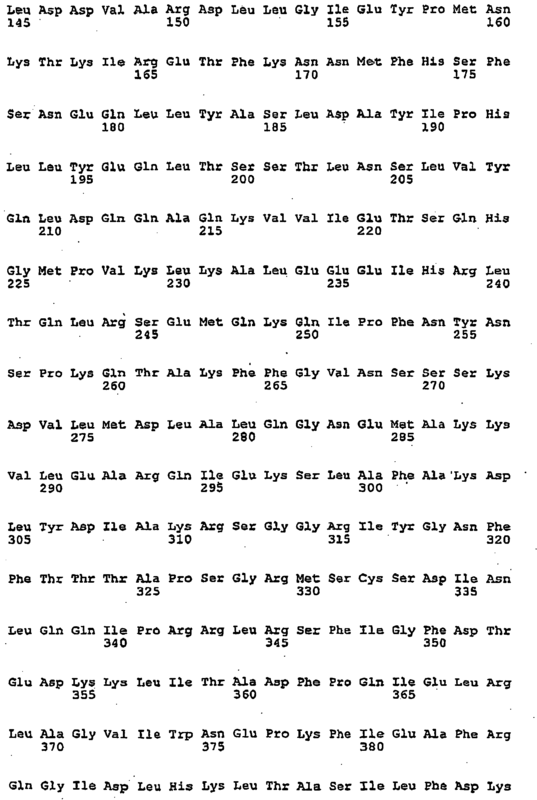 Results are shown in FIG. 5, Panel A. 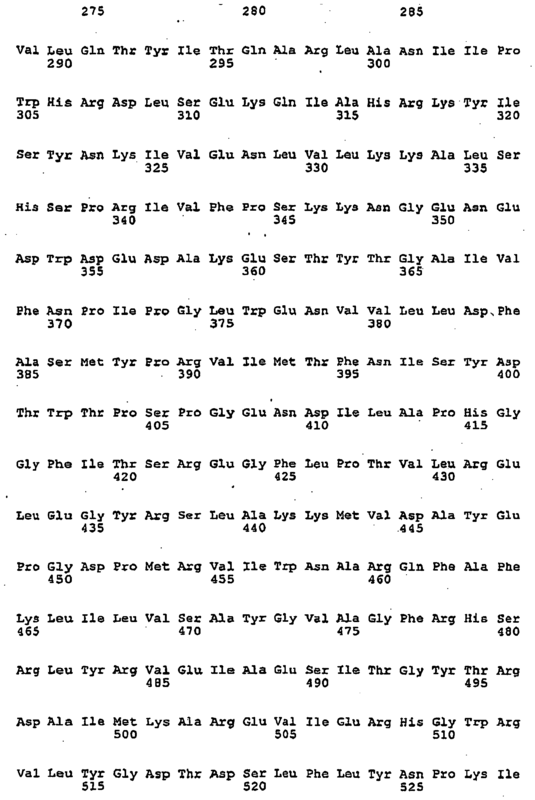 Lanes are as follows: five units of 3173 wild type DNA polymerase used to amplify M13mp18 single-stranded DNA template (lanes 2 and 3) and pUC19 double-stranded DNA (lanes 4 and 5) or no template (lane 6). Random ten nucleotide oligomer primers are added in the concentrations of 5 µM (lanes 2, 4 and 6) or 0.5 µM (lanes 3 and 5). As shown in FIG. 5, panel A, polymerase 3173 amplified both single- and double-stranded DNA templates. The estimated overall yield was approximately 50 µg for both templates, indicating amplification of up to 50,000-fold. A negative control reaction lacking template resulted in no significant yield of amplification product. To determine if the amplification was specific for the template DNA, one µl of the amplification product of the positive pUC19 reaction was tested in a PCR reaction using primers specific for a 1kb sequence in the bla gene of the original plasmid template. As a negative control, a reaction lacking deoxynucleotides was analyzed using PCR. As a positive control, the 1 kb sequence was amplified directly from 1 ng of pUC19. 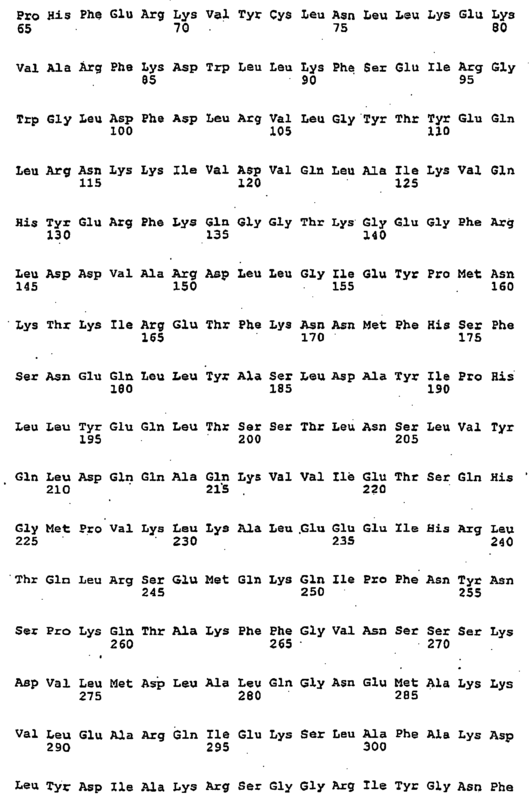 Results are shown in FIG. 5, Panel B. Lane 1 shows positive control amplification of the 1kb bla gene sequence of pUC19. Lane 2 shows amplification of the bla gene from the product amplified as described above. Lane 3 shows the results for the negative control. As expected, authentic amplification product was obtained using polymerase 3173. The 1 kb amplification product was detected by PCR in the test amplification reaction and in the positive control reaction, but not in the negative control amplification reaction. Example 16. Isothermal RCA in the absence of added primers. Reactions containing 10 ng of plasmid DNA, 20 mM Tris-HCl, 10 mM (NH4)2SO4, 10 mM KCl, 2 mM MgSO4, 0.1 % Triton X-100, pH 8.8 at 25°C, and 200 µM each of dGTP, dATP, dTTP and dCTP were incubated for 2 hours at 56°C with or without 10 units of nick-generating enzyme N.Bst NB1 (NEB) and either no DNA polymerase, 200 units of 3173 wt or 400 units of 3173 (D49A) mutant enzyme. Parallel reactions were performed in the absence of nicking enzyme, polymerase or both. Amplification products were analyzed by agarose gel electrophoresis. 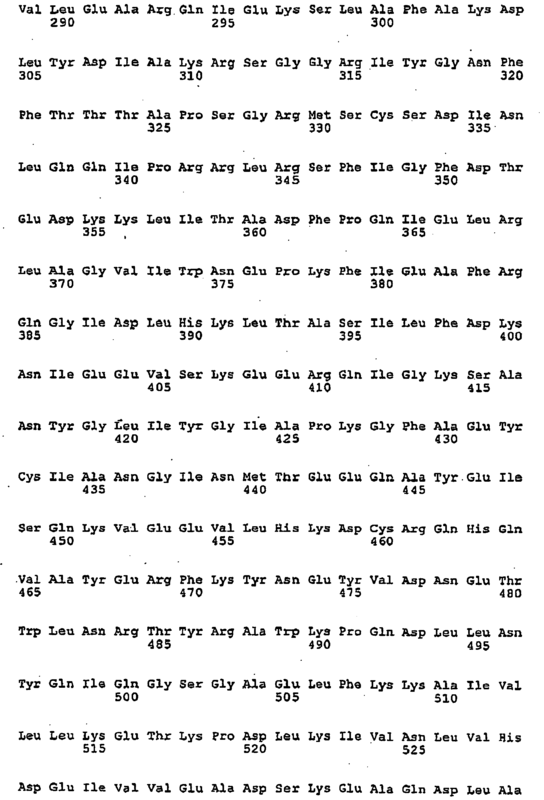 Results are shown in FIG. 6. Lanes are as follows: Nicking enzyme present (lanes 2-4) or absent (lanes 5-7). Polymerase 3173 (lanes 3 and 6) or D49A mutant (lanes 4 and 7). As shown in FIG. 6, multi-microgram yields of DNA product were obtained in the presence of both polymerase 3173 and the polymerase 3173 mutant D49A when the nicking enzyme was present, but not the absence of DNA polymerase or nicking enzyme. Example 17. Mutagenesis of the polymerase domain to reduce nucleotide discrimination. A 5' Rox-labeled primer complementary to M13mp18 nucleotides 6532 to 6571 (5nM) was annealed to single-stranded M13mp18 DNA (10nM) in a buffer containing 20 mM Tris-HCl, 10 mM (NH4)2SO4, 10 mM KCl, 2 mM MgSO4, 0.1 % Triton X-100, (pH 8.8 at 25°C, and 50 µM each of dGTP, dATP, dTTP and dCTP. In separate reactions, ddGTP, ddATP, ddTTP, and ddCTP were added to the above mix in concentrations of 50, 500 and 5000 µM each. Five units of polymerase 3173 mutant D49A were added and the reactions were incubated for 30 minutes at 70°C. Extension of the primer was detected by the ABI 310 Genetic Analyzer in Gene Scan mode. In this experiment, no inhibition of primer extension was detected, even at a 100-fold molar excess of chain terminator, suggesting a strong discrimination against the analogs by polymerase 3173 mutant D49A. In a second experiment, incorporation was tested by detection of DNA synthesis using a double-strand specific fluorescent dye, Pico Green (Invitrogen). Unlabeled M13 primer (2 µM) was added to M13mp18 ssDNA (1.2 µM) in buffer containing 20 mM Tris-HCl, 10 mM (NH4)2SO4, 10 mM KCl, 2 mM MgSO4, 0.1 % Triton X-100, pH 8.8 at 25°C, and 2 mM each of dGTP, dATP, dTTP and dCTP. In separate reactions, a mix of ddGTP, ddATP ddTTP, ddCTP (2 mM each) and a mix of the four acyNTPs (2mM each) were added to extension reactions followed by DNA polymerase. As a control, identical reactions without added chain terminating analogs were also performed. Polymerase 3173 mutant D49A was tested and, for comparison, T7 DNA polymerase, which incorporates ddNTPs with very low discrimination, and Klenow fragment of E. coli polymerase I and VENTR DNA polymerase (New England Biolabs), both of which have a higher discrimination, were also tested. Extension of the primer was detected by fluorescence of Pico Green dye. The results are tabulated below. Inhibition of the polymerase 3173 mutant D49A enzyme by chain terminators was minimal. Based on alignment with family A DNA polymerases, amino acid 418 of the polymerase 3173 mutant D49A was mutated from phenylalanine to tyrosine. The mutant protein was expressed and the cells lysed and heat-treated at 70°C for 10 minutes to inactivate host proteins. The polymerase 3173 mutant D49A/F418Y was tested for inhibition of radioactive nucleotide incorporation using chain terminating nucleotide analogs in the same mix as unlabeled deoxynucleotides. A reaction including 20 mM Tris-HCl, 10 mM (NH4)2SO4, 10 mM KCl, 2 mM MgSO4, 0.1 % Triton X-100, pH 8.8 at 25°C, 0.25 mg/ml activated ct DNA, 40 µM each of dGTP, dATP, dTTP and dCTP and 0.1 µCi [α P-33] dCTP was used. In separate reactions both the D49A/F418Y mutant and purified polymerase 3173 mutant D49A were tested for inhibition by 4 mM each of ddNTPs and 4 mM each acycloNTPs. A control with no chain terminators was included. 50 µl reactions were incubated at 70°C for 30 min. 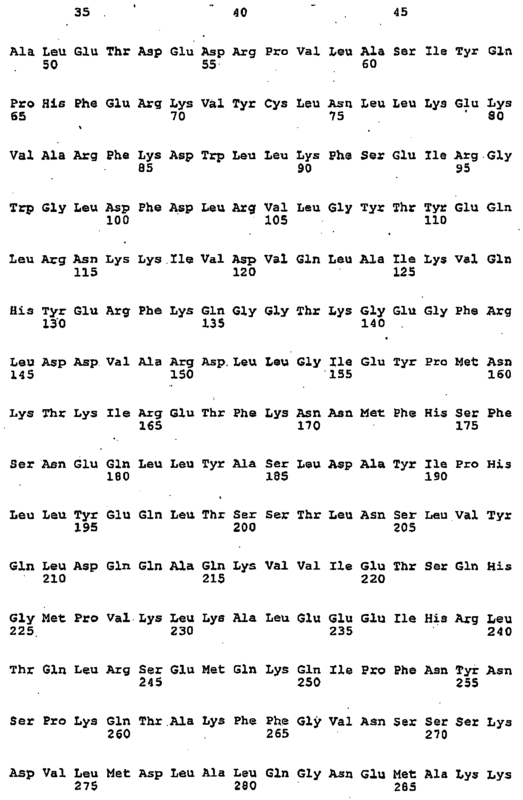 15 µl of each reaction was spotted on DE81 paper, washed and counted, and units of activity were determined as described in Example 6. The degree of inhibition due to incorporation of dideoxy- and acyclo-nucleotides is tabulated below. The polymerase 3173 double mutant D49A/F418Y was also tested in the fluorescent primer extension assay described above. A 2X ratio of ddGTP:dGTP almost completely inhibited any extension. A 0.2X ratio of ddGTP:dGTP resulted in nearly complete inhibition of primer extension, with no extension continuing beyond the fourth G residue. Together, this data suggests that discrimination by the polymerase 3173 mutant D49A/F418Y against the chain terminating nucleotides that were tested is nearly zero. 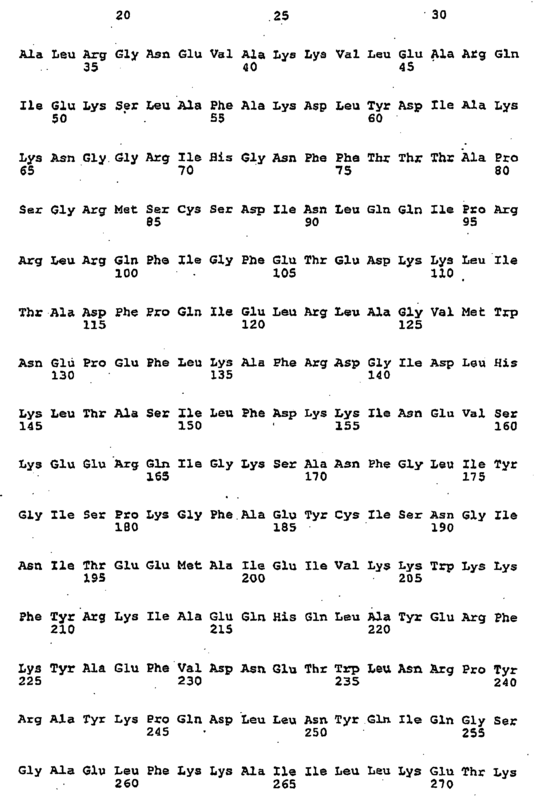 (b) an amino acid sequence having at least about 80% identity to any of SEQ ID NO:2, SEQ ID NO:4, SEQ ID NO:6, SEQ ID NO.8, SEQ ID NO:10, SEQ ID NO:12, SEQ ID NO:14, SEQ ID NO:16, SEQ ID NO: 18, SEQ ID NO:20, SEQ ID NO:25, SEQ ID NO:26, and SEQ ID NO:27, wherein the polymerase retains polymerase activity. The polymerase of claim 1, wherein the polymerase exhibits exonuclease activity. The polymerase of claim 1, wherein the polymerase substantially lacks exonuclease activity. The polymerase of claim 1 or 3, having a relative incorporation efficiency of nucleotide analogs that is at least 10% of the incorporation efficiency of standard deoxynucleotides. The polymerase of claim 1, wherein the polymerase exhibits reverse transcriptase activity. The polymerase of claim 1, wherein the polymerase exhibits strand displacement activity. (b) an amino acid sequence having at least about 80% identity to any of SEQ ID NO: 6, SEQ ID NO:25, SEQ ID NO: 26, and SEQ ID NO: 27, wherein the polymerase retains polymerase activity. 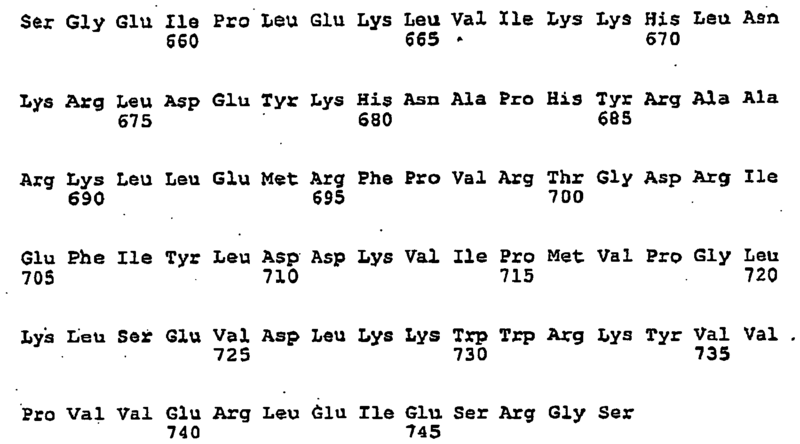 The polymerase of claim 1 comprising at least one amino acid substitution or deletion in the sequence of amino acids from residue 30 to residue 190 of SEQ ID NO:6, wherein the polypeptide substantially lacks exonuclease activity. The polymerase of claim 8 comprising a substitution of residue 49 or residue 51. 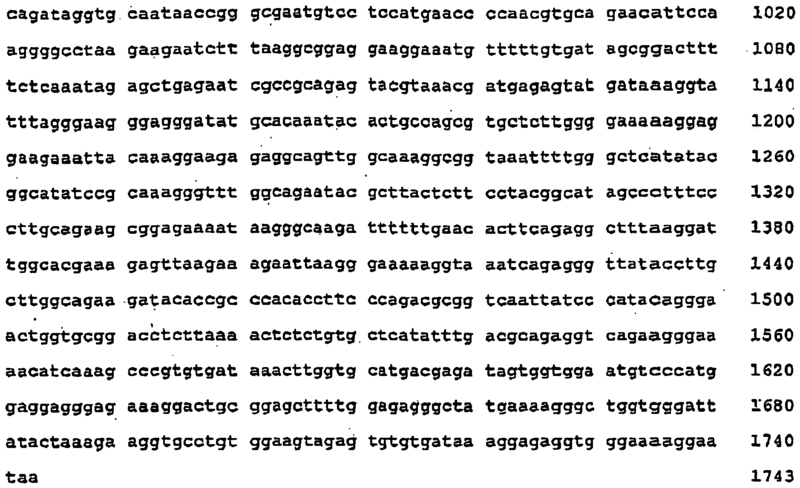 The polymerase of claim 9 comprising the sequence of SEQ ID NO:25, or SEQ ID NO:26. The polymerase of claim 9 further comprising a substitution of residue 418. 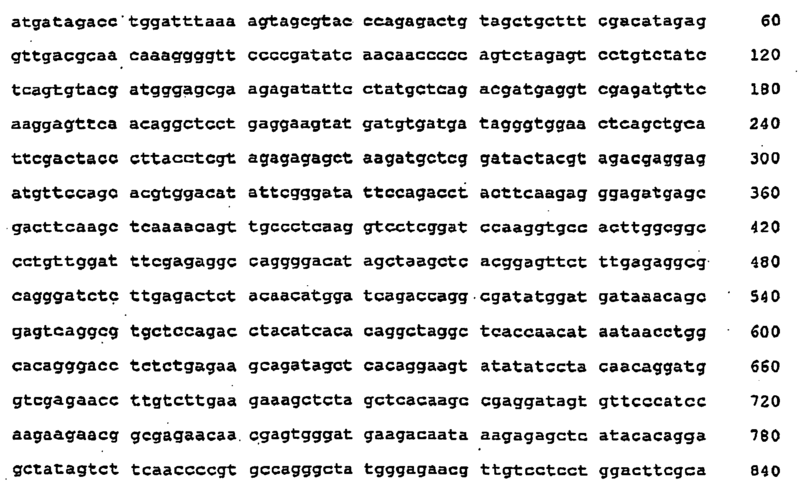 The polymerase of claim 4 or 11 comprising the amino acid sequence of SEQ ID NO:27. The polymerase of any one of claims 1 to 6, 8, 9, and 11, comprising an amino acid sequence having at least 85% identity to any one of SEQ ID NO:2, SEQ ID NO:4, SEQ ID NO:6, SEQ ID NO:8, SEQ ID NO:10, SEQ ID NO:12, SEQ ID NO:14, SEQ ID NO:16, SEQ ID NO:18, SEQ ID NO:20, SEQ ID NO:25, SEQ ID NO:26, and SEQ ID NO:27. The polymerase of any of claims 1 to 6, 8, 9, and 11, comprising and anmino acid sequence having at least 90% identity to any of SEQ ID NO:2, SEQ ID NO:4, SEQ ID NO:6, SEQ ID NO:8, SEQ ID NO:10, SEQ ID NO:12, SEQ ID NO:14, SEQ ID NO:16, SEQ ID NO:18, SEQ ID NO:20, SEQ ID NO:25, SEQ ID NO:26, and SEQ ID NO:27. The polymerase of any one of claims 1 to 6, 8, 9, and 11, comprising an amino acid sequence having at least 95% identity to any of SEQ ID NO:2, SEQ ID NO:4, SEQ ID NO:6, SEQ ID NO:8, SEQ ID NO:10, SEQ ID NO:12, SEQ ID NO:14, SEQ ID NO:16, SEQ ID NO:18, SEQ ID NO:20, SEQ ID NO:25, SEQ ID NO:28, and SEQ ID NO:27. The polymerase of any of claims 1 to 6, 8, 9, and 11, comprising an amino acid sequence having at least 99% identity to any one of SEQ ID NO:2, SEQ ID NO:4, SEQ ID NO:6, SEQ ID NO.8, SEQ ID NO:10, SEQ ID NO:12, SEQ ID NO:14, SEQ ID NO:16, SEQ ID NO: 18, SEQ ID NO:20, SEQ ID NO:25, SEQ ID NO:26, and SEQ ID NO:27. 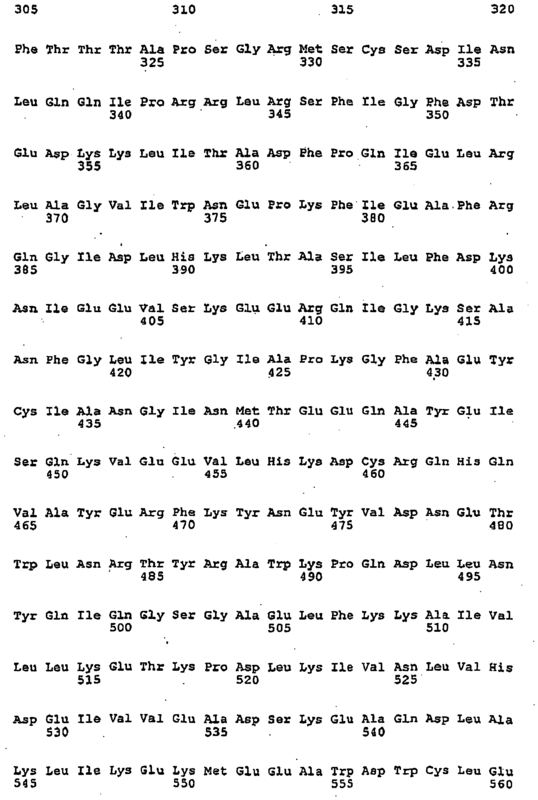 A composition comprising one or more polymerases of claim 1. (b) an amino acid sequence having at least about 80% identity to any of SEQ ID NO:6, SEQ ID NO:25, SEQ ID NO:26, and SEQ ID NO:27, wherein the polymerase retains polymerase activity. An isolated polynucleotide encoding the polymerase of any one of claims 1 and 13 to 16. The isolated polynucleotide of claim 19, comprising the sequence of SEQ ID NO: 5. A construct comprising the polynucleotide of claim 19 operably connected to a promoter. A recombinant host cell, comprising the construct of claim 21. A method of synthesizing a copy or complement of a polynucleotide template comprising contacting the polynucleotide template with the polymerase of any one of claims 1 and 13 to 16 under conditions sufficient to promote synthesis of the copy or complement. The method of claim 23, wherein the template is RNA or DNA. The method of claim 23, wherein the conditions comprise maintaining substantially isothermal conditions or thermocycling. The method of claim 23, wherein the conditions comprise the presence of at least one primer pair. The method of claim 23, wherein the conditions exclude manganese. The method of claim 23, wherein the polynucleotide template comprises an amplification-resistant sequence. The method of claim 23, wherein the conditions comprise the presence of a nick-inducing agent. A method of incorporating a nucleotide analog into a polynucleotide comprising contacting a template of the polynucleotide with the polymerase of claim 12 in the presence of the nucleotide analog. The method of claim 30, wherein the nucleotide analog is a chain-terminating analog. A method of sequencing a polynucleotide, wherein the polynucleotide is contacted with the polymerase of claim 12 in the presence of a chain-terminating nucleotide analog. FR2929011B1 (en) * 2008-03-20 2013-01-04 Commissariat Energie Atomique Method and quantitative measurement device has a high rate of biomolecular targets present on or in a biological analysis support. ES2331112T3 (en) 2009-12-22 New composition and method for nucleic acid amplification hot start.